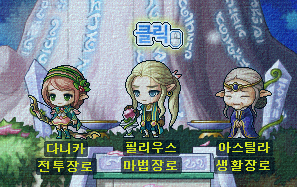 Well, in that time there were two patches in KMST; the first one introduced a new world called ‘Elf’ along with Mercedes’ storyline and the second one improved their performance in PvP. Yesterday was a patch in KMS, Mercedes are out! This post will be similar to my Cannon Shooter guide. Mercedes is NOT an adventurer, it is a hero. One of the 5 heroes who fought the Black Mage and sealed him away. Therefore, the beginning is very much like Aran, you start at level 200 and you are woken up after being frozen for years. Mercedes is an AMAZING mobber. Why? The Stylish Move skill enables them to do something no one else can do, climb a rope super fast, they start off with 140% speed and 120% jump, they have a flash jump-like skill since 1st job, and they get long-ranged mobbing skills in every job. They’re probably the best mobbers right now. As for creating a Mercedes, no it’s NOT gender locked. Mercedes wakes up in the middle of a battlefield during the battle against the Black Mage. She first sees Afrien and Freed both down. 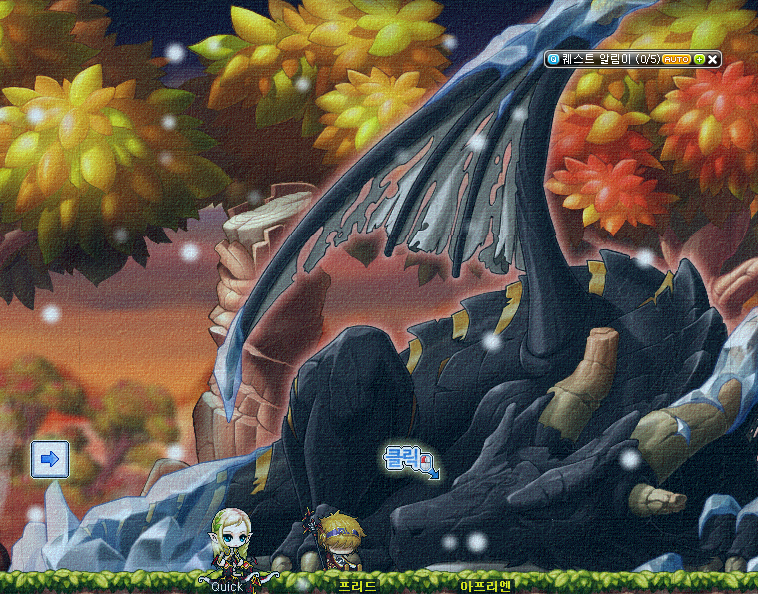 Afrien, the dragon, is the only one who can talk to Mercedes and explains to her how his master, Freed, took the curse of the Black Mage to protect his dragon Afrien and died. Afrien was very weak as well, but he managed to not only leave an egg behind to what will be Evan in 100 years, but also to send Mercedes back to her town Eurel to protect the people from the Black Mage. However, nothing she did worked and soon enough all the townspeople (the elders included) were frozen by the Black Mage. Eventually, the Black Mage reached Mercedes as well and she became frozen. Mercedes wakes up 100 years later. Note that when you started she was level 200, now she’s much weaker and only level 10. She attempts to leave Eurel to get some help from the Maple World on how she can unfreeze the townspeople, but she sees that she’s too weak to fight the slimes and so does not leave (if you watched the video, you also saw that she kind of freaks out). Basically kill 10 from the first room, 20 from the second, and 30 from the third and last. 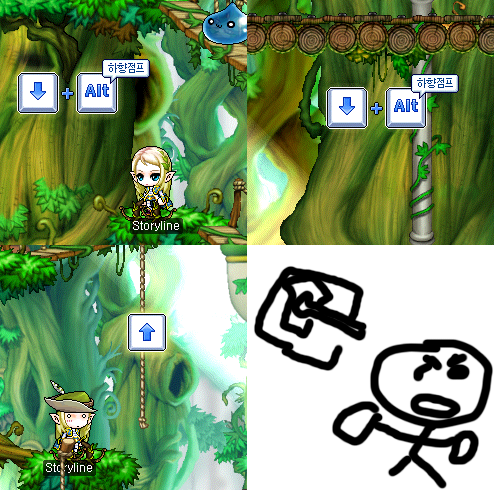 ^Actually, if you watched the video, the map changed when it was released to KMS (this is KMST). Why? Well, they understand the most about elves. Betty is the doctor (or professor?) 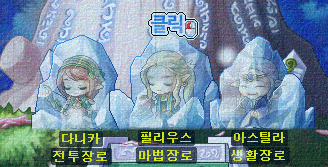 and the other two are fairies (which are somewhat related to elves?). The reason I call them ‘the other two’ is because thankfully they don’t have a lot of quests. They just want you to talk to the Talking Tree. Betty’s quests are annoying, though. She will make you get 20 samples from Evil Eyes/Curse Eyes and 5 samples from plants. If you didn’t like Betty, you’re going to hate him even more. Now he wants you to go kill Iron Boars and get 50 bones from them! 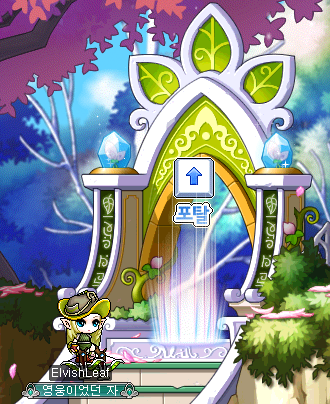 The drop rate is actually very high in KMS, so it’s not too bad. But now he wants you to go back to Eurel to get him a book. Sooo, go back to Eurel and click on the library. 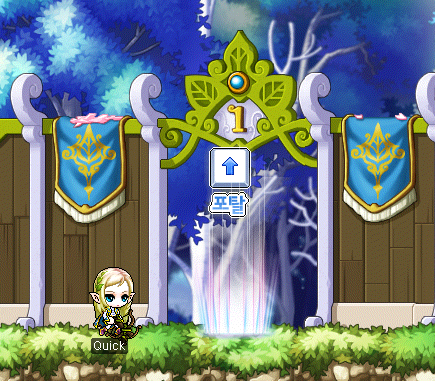 Luckily, the Elf’s Blessing skill will teleport you there. Go back to Winston and he’ll give you Arcon’s Blood to give Manji. Now you’re done with his quests! Betty will want you back at level 23 and send you to Bruce in Henesys. Bruce will then tell you to kill Stone Golems. Now his next quest is to face Zombie Mushmom. Using that perfume, you’ll get to fight Zombie Mushmom in a map of your own! No KS’ers or anything, just a mini dungeon. Return it to Bruce and now train till level 28. The townspeople are still frozen, but at least the elders are free. Phyllius will then send you to Betty in Ellinia. Betty will send you to Helena in Henesys. 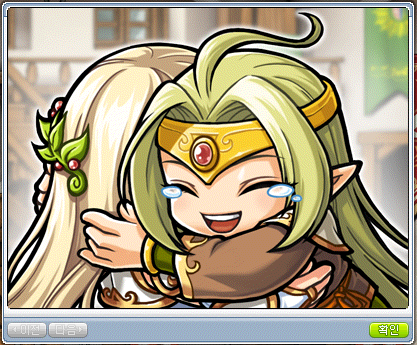 Helena is so happy! She’s so glad to know that Mercedes was actually frozen for 100 years and not dead. Defeat the puppeteer (should be fairly easy but annoying)! Helena will then appear to congratulate you. Yeah, thanks for helping! 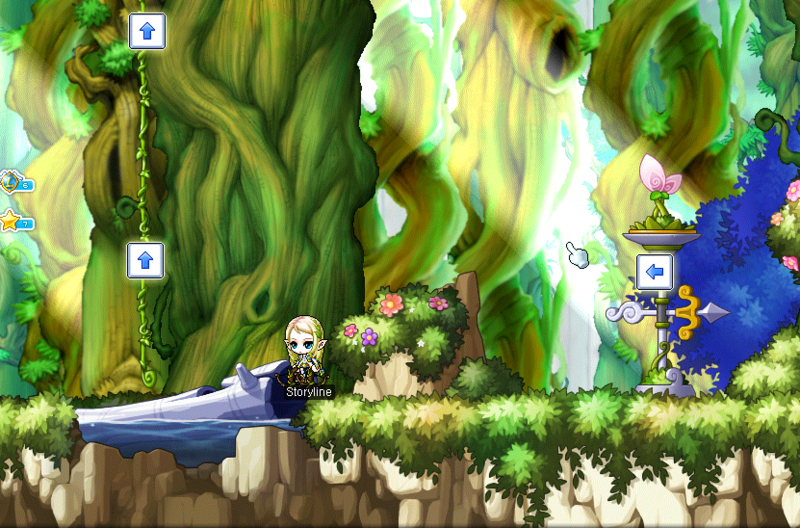 Helena will then send you to the map right next to Eurel (the one that’s under the waterfall). The map is full of Black Wing Rabbits! Yep, Helena ran off to Eurel after seeing that the Black Wings made their move in Henesys. Anyway, she’ll give you another quest to go to Nineheart in Ereve this time. 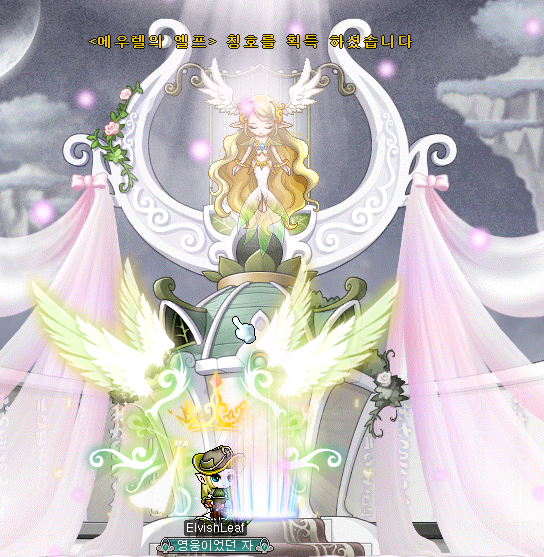 Go to Ereve and talk to him and Cygnus. Helena wants you to ask them to help fight Black Wing, but Nineheart refuses at first. Only Cygnus agrees and persuades Nineheart to help Mercedes. You obviously have to go to Eurel… When you get there, though, you’ll notice that the Cygnus actually came to protect Eurel from Black Wings! Congratulations! You’re now a 2nd jobber! Mercedes do not use arrows or anything else. Also, they do not use weapons we already have right now. They use a special weapon called Dual Bow Gun along with another weapon in the shield slot called Mercedes Arrow. Oh and job advancements, the only advancement you need to do is 2nd job. You will advance automatically at level 10, 70, and 120. Premium Scissors of Karma may be used. Alrighty! That’s all for the weapons. Also keep in mind that they can wear any Bowmen equipment. Lets move on to skills now! 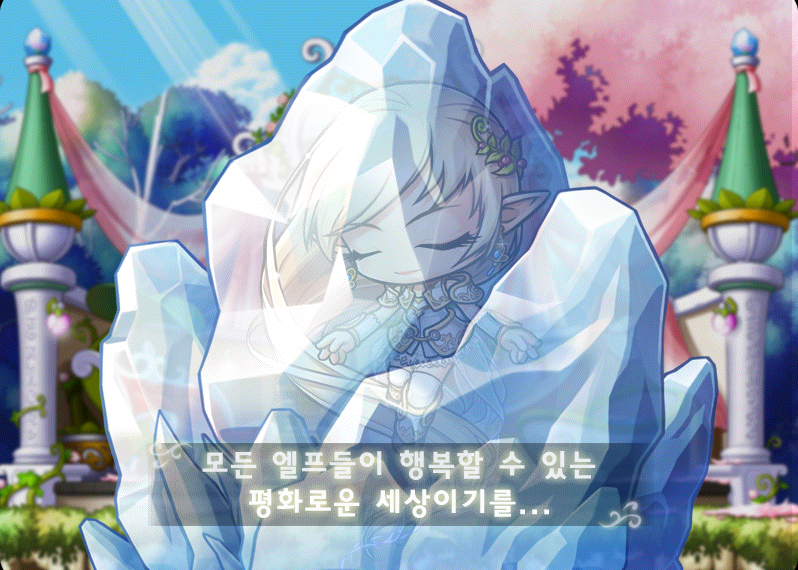 Elf’s Recovery – Use nature’s purified energy to recover HP and MP. Recovers 5% HP and MP up to 4 times per second. 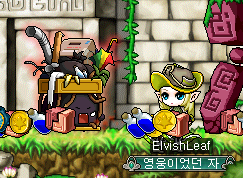 Elf’s Blessing – [Racial Skill] Return to Eurel and receive the blessing from the ancient elves and you’ll permanently get additional EXP. Additional Effect: Permanently adds 10% EXP. Stylish Move – Let’s you quickly move up a ladder or a rope. King’s Qualifications – Elves’ Kings are born with fast moves and attacks, along with a deadly charm. Permanently improves your attack speed by 1, Movement Speed by 10, Jump by 20, and Charm by 30 levels. 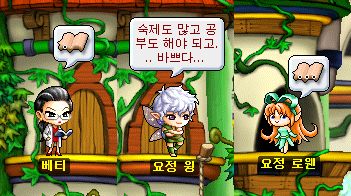 Note that the Elf’s Blessing skill is a Racial Skill which we discussed in part one. It basically means that if you’re level 70 or above you may ‘link’ it to one more character of your choice. So any character of yours can get 10% extra EXP! Description: Fire arrows at a large number of enemies in front of you. Level 1: MP Cost: 8, Fires arrows at 3 enemies 2 times and deals 96% damage. Level 2: MP Cost: 8, Fires arrows at 3 enemies 2 times and deals 97% damage. Level 3: MP Cost: 8, Fires arrows at 3 enemies 2 times and deals 98% damage. Level 4: MP Cost: 8, Fires arrows at 3 enemies 2 times and deals 99% damage. Level 5: MP Cost: 8, Fires arrows at 3 enemies 2 times and deals 100% damage. Level 6: MP Cost: 10, Fires arrows at 3 enemies 2 times and deals 101% damage. Level 7: MP Cost: 10, Fires arrows at 3 enemies 2 times and deals 102% damage. Level 8: MP Cost: 10, Fires arrows at 3 enemies 2 times and deals 103% damage. Level 9: MP Cost: 10, Fires arrows at 3 enemies 2 times and deals 104% damage. Level 10: MP Cost: 10, Fires arrows at 3 enemies 2 times and deals 105% damage. Level 11: MP Cost: 10, Fires arrows at 3 enemies 2 times and deals 106% damage. Level 12: MP Cost: 12, Fires arrows at 3 enemies 2 times and deals 107% damage. Level 13: MP Cost: 12, Fires arrows at 3 enemies 2 times and deals 108% damage. Level 14: MP Cost: 12, Fires arrows at 3 enemies 2 times and deals 109% damage. Level 15: MP Cost: 12, Fires arrows at 3 enemies 2 times and deals 110% damage. Level 16: MP Cost: 12, Fires arrows at 3 enemies 2 times and deals 111% damage. Level 17: MP Cost: 12, Fires arrows at 3 enemies 2 times and deals 112% damage. Level 18: MP Cost: 14, Fires arrows at 3 enemies 2 times and deals 113% damage. Level 19: MP Cost: 14, Fires arrows at 3 enemies 2 times and deals 114% damage. Level 20: MP Cost: 14, Fires arrows at 3 enemies 2 times and deals 115% damage. Description: Permanently activates your inner potential force. Speed and maximum speed will be increased, along with an increasing chance of avoiding the enemy’s attacks. Level 1: Speed increased by 2, Maximum speed increased to 151, 6% chance to ignore the enemy’s attack. Level 2: Speed increased by 4, Maximum speed increased to 152, 7% chance to ignore the enemy’s attack. Level 3: Speed increased by 6, Maximum speed increased to 153, 8% chance to ignore the enemy’s attack. Level 4: Speed increased by 8, Maximum speed increased to 154, 9% chance to ignore the enemy’s attack. Level 5: Speed increased by 10, Maximum speed increased to 155, 10% chance to ignore the enemy’s attack. Level 6: Speed increased by 12, Maximum speed increased to 156, 11% chance to ignore the enemy’s attack. Level 7: Speed increased by 14, Maximum speed increased to 157, 12% chance to ignore the enemy’s attack. Level 8: Speed increased by 16, Maximum speed increased to 158, 13% chance to ignore the enemy’s attack. Level 9: Speed increased by 18, Maximum speed increased to 159, 14% chance to ignore the enemy’s attack. Level 10: Speed increased by 20, Maximum speed increased to 160, 15% chance to ignore the enemy’s attack. Level 11: Speed increased by 22, Maximum speed increased to 161, 16% chance to ignore the enemy’s attack. Level 12: Speed increased by 24, Maximum speed increased to 162, 17% chance to ignore the enemy’s attack. Level 13: Speed increased by 26, Maximum speed increased to 163, 18% chance to ignore the enemy’s attack. Level 14: Speed increased by 28, Maximum speed increased to 164, 19% chance to ignore the enemy’s attack. Level 15: Speed increased by 30, Maximum speed increased to 165, 20% chance to ignore the enemy’s attack. Description: Jump on a trampoline and fly for a long distance in its direction. As the skill level rises, the distance you can flay for increases. Level 1: MP Cost: 28, jumps for a certain distance. Level 2: MP Cost: 26, jumps for a certain distance. Level 3: MP Cost: 24, jumps for a certain distance. Level 4: MP Cost: 22, jumps for a certain distance. Level 5: MP Cost: 20, jumps for a certain distance. Level 6: MP Cost: 18, jumps for a certain distance. Level 7: MP Cost: 16, jumps for a certain distance. Level 8: MP Cost: 14, jumps for a certain distance. 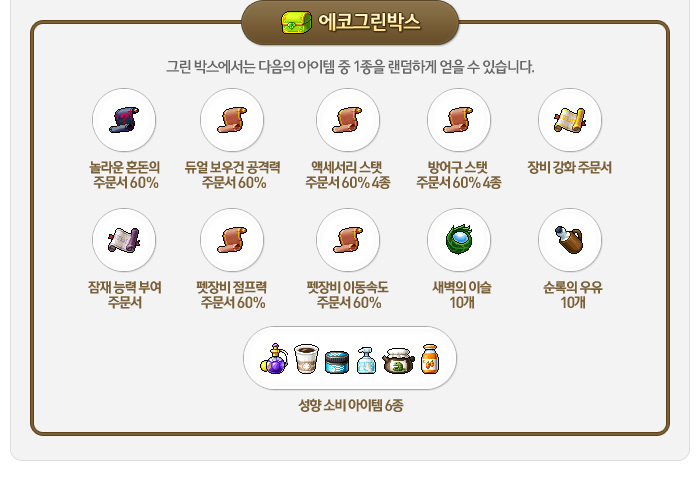 Level 9: MP Cost: 12, jumps for a certain distance. Level 10: MP Cost: 10, jumps for a certain distance. Description: Permanently increases your critical rate. Level 1: Critical Rate increased by 2%. Level 2: Critical Rate increased by 4%. Level 3: Critical Rate increased by 6%. Level 4: Critical Rate increased by 8%. Level 5: Critical Rate increased by 10%. Level 6: Critical Rate increased by 12%. Level 7: Critical Rate increased by 14%. Level 8: Critical Rate increased by 16%. Level 9: Critical Rate increased by 18%. Level 10: Critical Rate increased by 20%. Level 11: Critical Rate increased by 22%. Level 12: Critical Rate increased by 24%. Level 13: Critical Rate increased by 26%. Level 14: Critical Rate increased by 28%. Level 15: Critical Rate increased by 30%. Level 16: Critical Rate increased by 32%. Level 17: Critical Rate increased by 34%. Level 18: Critical Rate increased by 36%. Level 19: Critical Rate increased by 38%. Level 20: Critical Rate increased by 40%. Sharp Aiming which will get your Critical Rate up to 45%. 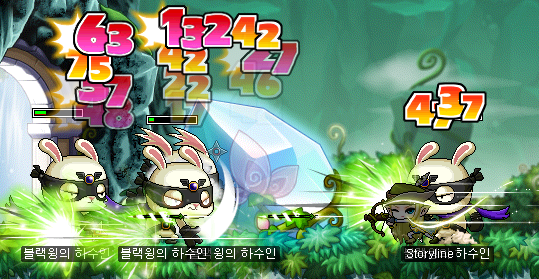 Remember that this is KMST v.1.2.391. Effects: Effect, Ball, Hit, Mob. Description: Infuse the force of nature with sharp arrows to continuously fire. The attack can penetrate a large number of enemies. Level 1: MP Cost: 14, Pierces up to 6 enemies 4 times and deals 64% damage. Level 2: MP Cost: 15, Pierces up to 6 enemies 4 times and deals 65% damage. Level 3: MP Cost: 15, Pierces up to 6 enemies 4 times and deals 66% damage. Level 4: MP Cost: 16, Pierces up to 6 enemies 4 times and deals 67% damage. Level 5: MP Cost: 16, Pierces up to 6 enemies 4 times and deals 68% damage. Level 6: MP Cost: 17, Pierces up to 6 enemies 4 times and deals 69% damage. Level 7: MP Cost: 17, Pierces up to 6 enemies 4 times and deals 70% damage. Level 8: MP Cost: 18, Pierces up to 6 enemies 4 times and deals 71% damage. Level 9: MP Cost: 18, Pierces up to 6 enemies 4 times and deals 72% damage. Level 10: MP Cost: 19, Pierces up to 6 enemies 4 times and deals 73% damage. Level 11: MP Cost: 19, Pierces up to 6 enemies 4 times and deals 74% damage. Level 12: MP Cost: 20, Pierces up to 6 enemies 4 times and deals 75% damage. Level 13: MP Cost: 20, Pierces up to 6 enemies 4 times and deals 76% damage. Level 14: MP Cost: 21, Pierces up to 6 enemies 4 times and deals 77% damage. Level 15: MP Cost: 21, Pierces up to 6 enemies 4 times and deals 78% damage. Level 16: MP Cost: 22, Pierces up to 6 enemies 4 times and deals 79% damage. Level 17: MP Cost: 22, Pierces up to 6 enemies 4 times and deals 80% damage. Level 18: MP Cost: 23, Pierces up to 6 enemies 4 times and deals 81% damage. Level 19: MP Cost: 23, Pierces up to 6 enemies 4 times and deals 82% damage. Level 20: MP Cost: 24, Pierces up to 6 enemies 4 times and deals 83% damage. Effects: Pushing monsters: Effect, Effect0. Launching to the air: Effect, Hit. Description: Push a large number of enemies forward and launch them to the air. While in air, extra damage will be dealt on enemies. Level 1: MP Cost: 20, Pushes up to 8 enemies and deals 102% damage. 182% damage will be done when the enemies are launched into the air and 2% bonus damage to airborne enemies will be given. Level 2: MP Cost: 20, Pushes up to 8 enemies and deals 104% damage. 184% damage will be done when the enemies are launched into the air and 4% bonus damage to airborne enemies will be given. Level 3: MP Cost: 21, Pushes up to 8 enemies and deals 106% damage. 186% damage will be done when the enemies are launched into the air and 6% bonus damage to airborne enemies will be given. Level 4: MP Cost: 21, Pushes up to 8 enemies and deals 108% damage. 188% damage will be done when the enemies are launched into the air and 8% bonus damage to airborne enemies will be given. Level 5: MP Cost: 21, Pushes up to 8 enemies and deals 110% damage. 190% damage will be done when the enemies are launched into the air and 10% bonus damage to airborne enemies will be given. Level 6: MP Cost: 22, Pushes up to 8 enemies and deals 112% damage. 192% damage will be done when the enemies are launched into the air and 12% bonus damage to airborne enemies will be given. Level 7: MP Cost: 22, Pushes up to 8 enemies and deals 114% damage. 194% damage will be done when the enemies are launched into the air and 14% bonus damage to airborne enemies will be given. Level 8: MP Cost: 22, Pushes up to 8 enemies and deals 116% damage. 196% damage will be done when the enemies are launched into the air and 16% bonus damage to airborne enemies will be given. Level 9: MP Cost: 23, Pushes up to 8 enemies and deals 118% damage. 198% damage will be done when the enemies are launched into the air and 18% bonus damage to airborne enemies will be given. Level 10: MP Cost: 23, Pushes up to 8 enemies and deals 120% damage. 200% damage will be done when the enemies are launched into the air and 20% bonus damage to airborne enemies will be given. Level 11: MP Cost: 23, Pushes up to 8 enemies and deals 122% damage. 202% damage will be done when the enemies are launched into the air and 22% bonus damage to airborne enemies will be given. Level 12: MP Cost: 24, Pushes up to 8 enemies and deals 124% damage. 204% damage will be done when the enemies are launched into the air and 24% bonus damage to airborne enemies will be given. Level 13: MP Cost: 24, Pushes up to 8 enemies and deals 126% damage. 206% damage will be done when the enemies are launched into the air and 26% bonus damage to airborne enemies will be given. Level 14: MP Cost: 24, Pushes up to 8 enemies and deals 128% damage. 208% damage will be done when the enemies are launched into the air and 28% bonus damage to airborne enemies will be given. Level 15: MP Cost: 25, Pushes up to 8 enemies and deals 130% damage. 210% damage will be done when the enemies are launched into the air and 30% bonus damage to airborne enemies will be given. Description: Use MP to double the attack speed of your dual bow gun for a certain period of time. Level 1: MP Cost: 30, Duration: 10 seconds. Level 2: MP Cost: 29, Duration: 20 seconds. Level 3: MP Cost: 28, Duration: 30 seconds. Level 4: MP Cost: 27, Duration: 40 seconds. Level 5: MP Cost: 26, Duration: 50 seconds. Level 6: MP Cost: 25, Duration: 60 seconds. Level 7: MP Cost: 24, Duration: 70 seconds. Level 8: MP Cost: 23, Duration: 80 seconds. Level 9: MP Cost: 22, Duration: 90 seconds. Level 10: MP Cost: 21, Duration: 100 seconds. Level 11: MP Cost: 20, Duration: 110 seconds. Level 12: MP Cost: 19, Duration: 120 seconds. Level 13: MP Cost: 18, Duration: 130 seconds. Level 14: MP Cost: 17, Duration: 140 seconds. Level 15: MP Cost: 16, Duration: 150 seconds. Level 16: MP Cost: 15, Duration: 160 seconds. Level 17: MP Cost: 14, Duration: 170 seconds. Level 18: MP Cost: 13, Duration: 180 seconds. 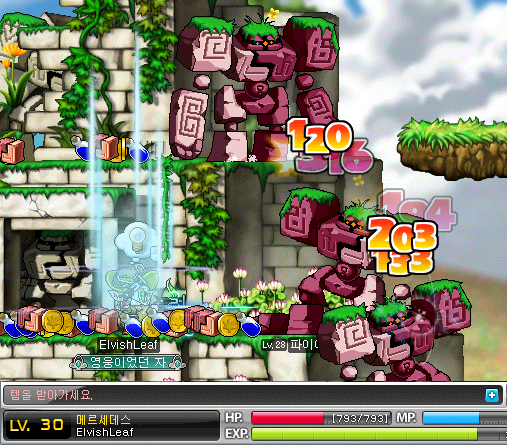 Level 19: MP Cost: 12, Duration: 190 seconds. Level 20: MP Cost: 11, Duration: 200 seconds. Description: Increases your damage and Critical Rate for a period of time. Level 1: MP Cost: 25, Duration: 68 seconds, Additional Damage: 1, Critical Rate increased by 1%. Level 2: MP Cost: 25, Duration: 76 seconds, Additional Damage: 2, Critical Rate increased by 2%. Level 3: MP Cost: 25, Duration: 84 seconds, Additional Damage: 3, Critical Rate increased by 3%. Level 4: MP Cost: 30, Duration: 92 seconds, Additional Damage: 4, Critical Rate increased by 4%. Level 5: MP Cost: 30, Duration: 100 seconds, Additional Damage: 5, Critical Rate increased by 5%. Level 6: MP Cost: 30, Duration: 108 seconds, Additional Damage: 6, Critical Rate increased by 6%. Level 7: MP Cost: 35, Duration: 116 seconds, Additional Damage: 7, Critical Rate increased by 7%. Level 8: MP Cost: 35, Duration: 124 seconds, Additional Damage: 8, Critical Rate increased by 8%. Level 9: MP Cost: 35, Duration: 132 seconds, Additional Damage: 9, Critical Rate increased by 9%. Level 10: MP Cost: 40, Duration: 140 seconds, Additional Damage: 10, Critical Rate increased by 10%. Level 11: MP Cost: 40, Duration: 148 seconds, Additional Damage: 11, Critical Rate increased by 11%. Level 12: MP Cost: 40, Duration: 156 seconds, Additional Damage: 12, Critical Rate increased by 12%. Level 13: MP Cost: 45, Duration: 164 seconds, Additional Damage: 13, Critical Rate increased by 13%. Level 14: MP Cost: 45, Duration: 172 seconds, Additional Damage: 14, Critical Rate increased by 14%. Level 15: MP Cost: 45, Duration: 180 seconds, Additional Damage: 15, Critical Rate increased by 15%. Effects: Effect, Hit -> 1, 2, 3, 4. Description: After using Charge Drive to drive your enemies into the air, arrows will fly towards your enemies and attack them. Level 1: MP Cost: 12, Attacks up to 8 enemies and deals 66% damage 4 times. Level 2: MP Cost: 12, Attacks up to 8 enemies and deals 72% damage 4 times. Level 3: MP Cost: 12, Attacks up to 8 enemies and deals 78% damage 4 times. Level 4: MP Cost: 12, Attacks up to 8 enemies and deals 84% damage 4 times. Level 5: MP Cost: 16, Attacks up to 8 enemies and deals 90% damage 4 times. Description: Increases the proficiency of all dual bow guns and accuracy. Level 1: Dual Bow Gun Mastery +12%, Accuracy +6. Level 2: Dual Bow Gun Mastery +14%, Accuracy +12. Level 3: Dual Bow Gun Mastery +16%, Accuracy +18. Level 4: Dual Bow Gun Mastery +18%, Accuracy +24. Level 5: Dual Bow Gun Mastery +20%, Accuracy +30. Level 6: Dual Bow Gun Mastery +22%, Accuracy +36. Level 7: Dual Bow Gun Mastery +24%, Accuracy +42. Level 8: Dual Bow Gun Mastery +26%, Accuracy +48. Level 9: Dual Bow Gun Mastery +28%, Accuracy +54. Level 10: Dual Bow Gun Mastery +30%, Accuracy +60. Level 11: Dual Bow Gun Mastery +32%, Accuracy +66. Level 12: Dual Bow Gun Mastery +34%, Accuracy +72. Level 13: Dual Bow Gun Mastery +36%, Accuracy +78. Level 14: Dual Bow Gun Mastery +38%, Accuracy +84. Level 15: Dual Bow Gun Mastery +40%, Accuracy +90. Level 16: Dual Bow Gun Mastery +42%, Accuracy +96. Level 17: Dual Bow Gun Mastery +44%, Accuracy +102. Level 18: Dual Bow Gun Mastery +46%, Accuracy +108. Level 19: Dual Bow Gun Mastery +48%, Accuracy +114. Level 20: Dual Bow Gun Mastery +50%, Accuracy +120. Description: Grants a chance to deal additional damage after an attack. Must have a dual bow gun equipped. Level 1: Proc Rate: 2%, Damage: 55%, Number of Attacks: 2. Level 2: Proc Rate: 4%, Damage: 57%, Number of Attacks: 2. Level 3: Proc Rate: 6%, Damage: 57%, Number of Attacks: 2. Level 4: Proc Rate: 8%, Damage: 59%, Number of Attacks: 2. Level 5: Proc Rate: 10%, Damage: 59%, Number of Attacks: 2. Level 6: Proc Rate: 12%, Damage: 61%, Number of Attacks: 2. Level 7: Proc Rate: 14%, Damage: 61%, Number of Attacks: 2. Level 8: Proc Rate: 16%, Damage: 63%, Number of Attacks: 2. Level 9: Proc Rate: 18%, Damage: 63%, Number of Attacks: 2. Level 10: Proc Rate: 20%, Damage: 65%, Number of Attacks: 2. Level 11: Proc Rate: 22%, Damage: 65%, Number of Attacks: 2. 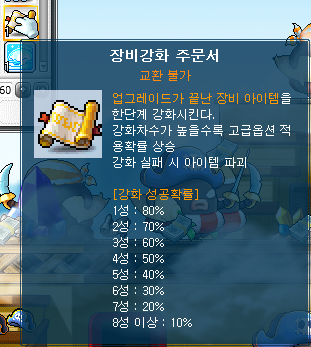 Level 12: Proc Rate: 24%, Damage: 67%, Number of Attacks: 2. Level 13: Proc Rate: 26%, Damage: 67%, Number of Attacks: 2. Level 14: Proc Rate: 28%, Damage: 69%, Number of Attacks: 2. Level 15: Proc Rate: 30%, Damage: 69%, Number of Attacks: 2. Level 16: Proc Rate: 32%, Damage: 71%, Number of Attacks: 2. Level 17: Proc Rate: 34%, Damage: 71%, Number of Attacks: 2. Level 18: Proc Rate: 36%, Damage: 73%, Number of Attacks: 2. Level 19: Proc Rate: 38%, Damage: 73%, Number of Attacks: 2. Level 20: Proc Rate: 40%, Damage: 75%, Number of Attacks: 2. Description: Through physical fitness, improve your strength and dexterity. Level 1: STR +3, DEX +3. Level 2: STR +6, DEX +6. Level 3: STR +9, DEX +9. Level 4: STR +12, DEX +12. Level 5: STR +15, DEX +15. Level 6: STR +18, DEX +18. Level 7: STR +21, DEX +21. Level 8: STR +24, DEX +24. Level 9: STR +27, DEX +27. Level 10: STR +30, DEX +30. Explanation: We first start out with Cross Piercing which is basically the only skill you will use till 3rd job. However, just to add more variation, you also put 1 SP into Charge Drive and Final Shot. We max your main skill, Cross Piercing, obviously first. We then max Spirit Infusion for additional damage and Critical Rate! By the time it’s maxed your Critical Rate should be 60% and you need to double your attack speed now. To do so, we need to put 5 SP into Dual Bow Gun Mastery first and only then we can put 6 SP into Dual Bow Gun Booster so you can have a 1 minute booster. I know you’re all eager to STR/DEX boosts now! Physical Training is max so you can ger 30 STR/DEX. More buffs now once we max Dual Bow Gun Mastery. Now, we’re going to max Final Attack : Dual Bow Gun. I know most of you think it’s useless for archers, but the one for Mercedes is just like the Wild Hunter one so it’s like an extra hit, two hits actually. Not only does it greatly increase your DPS/DPM, but it’s also REQUIRED. It gets buffed in 4th job and you HAVE to max it. Final Shot is not that necessary, you can leave it at level 1. The max level is 5 anyway, and it’s not necessary to be maxed like Final Attack : Dual Bow Gun. Future skills that are just like, that you use after Charge Drive, DO NOT require Final Shot to be maxed, so what’s the point? Last few things we do is max Charge Drive and Dual Bow Gun Booster for obvious reasons. Effects: Effect, Ball, Hit -> 1, 2, Mob. Description: Shoot a large number of arrows at many enemies in front of you very rapidly. Also, there’s a probability to stun the enemy. Level 1: MP Cost: 20, Attacks up to 4 enemies and deals 107% damage on them 4 times, 23% chance to stun the enemy for 2 seconds. Level 2: MP Cost: 20, Attacks up to 4 enemies and deals 108% damage on them 4 times, 26% chance to stun the enemy for 2 seconds. Level 3: MP Cost: 20, Attacks up to 4 enemies and deals 109% damage on them 4 times, 29% chance to stun the enemy for 2 seconds. Level 4: MP Cost: 23, Attacks up to 4 enemies and deals 110% damage on them 4 times, 32% chance to stun the enemy for 2 seconds. Level 5: MP Cost: 23, Attacks up to 4 enemies and deals 111% damage on them 4 times, 35% chance to stun the enemy for 3 seconds. Level 6: MP Cost: 23, Attacks up to 4 enemies and deals 112% damage on them 4 times, 38% chance to stun the enemy for 3 seconds. Level 7: MP Cost: 23, Attacks up to 4 enemies and deals 113% damage on them 4 times, 41% chance to stun the enemy for 3 seconds. Level 8: MP Cost: 26, Attacks up to 4 enemies and deals 114% damage on them 4 times, 44% chance to stun the enemy for 3 seconds. Level 9: MP Cost: 26, Attacks up to 4 enemies and deals 115% damage on them 4 times, 47% chance to stun the enemy for 3 seconds. Level 10: MP Cost: 26, Attacks up to 4 enemies and deals 116% damage on them 4 times, 50% chance to stun the enemy for 4 seconds. Level 11: MP Cost: 26, Attacks up to 4 enemies and deals 117% damage on them 4 times, 53% chance to stun the enemy for 4 seconds. Level 12: MP Cost: 29, Attacks up to 4 enemies and deals 118% damage on them 4 times, 56% chance to stun the enemy for 4 seconds. Level 13: MP Cost: 29, Attacks up to 4 enemies and deals 119% damage on them 4 times, 59% chance to stun the enemy for 4 seconds. Level 14: MP Cost: 29, Attacks up to 4 enemies and deals 120% damage on them 4 times, 62% chance to stun the enemy for 4 seconds. Level 15: MP Cost: 29, Attacks up to 4 enemies and deals 121% damage on them 4 times, 65% chance to stun the enemy for 5 seconds. Level 16: MP Cost: 32, Attacks up to 4 enemies and deals 122% damage on them 4 times, 68% chance to stun the enemy for 5 seconds. Level 17: MP Cost: 32, Attacks up to 4 enemies and deals 123% damage on them 4 times, 71% chance to stun the enemy for 5 seconds. Level 18: MP Cost: 32, Attacks up to 4 enemies and deals 124% damage on them 4 times, 74% chance to stun the enemy for 5 seconds. Level 19: MP Cost: 32, Attacks up to 4 enemies and deals 125% damage on them 4 times, 77% chance to stun the enemy for 5 seconds. Level 20: MP Cost: 35, Attacks up to 4 enemies and deals 126% damage on them 4 times, 80% chance to stun the enemy for 6 seconds. Effects: Effect, Effect0, Hit -> 1, 2, Mob, Tile -> 1, 2. Description: Jump and rotate your body quickly and shoot arrows. The skill can only be done when you jump to a height of at least 120%. Level 1: MP Cost: 33, Attacks up to 8 enemies and deals 97% damage 4 times. Level 2: MP Cost: 33, Attacks up to 8 enemies and deals 99% damage 4 times. Level 3: MP Cost: 33, Attacks up to 8 enemies and deals 101% damage 4 times. Level 4: MP Cost: 33, Attacks up to 8 enemies and deals 103% damage 4 times. Level 5: MP Cost: 36, Attacks up to 8 enemies and deals 105% damage 4 times. Level 6: MP Cost: 36, Attacks up to 8 enemies and deals 107% damage 4 times. Level 7: MP Cost: 36, Attacks up to 8 enemies and deals 109% damage 4 times. Level 8: MP Cost: 36, Attacks up to 8 enemies and deals 111% damage 4 times. Level 9: MP Cost: 39, Attacks up to 8 enemies and deals 113% damage 4 times. Level 10: MP Cost: 39, Attacks up to 8 enemies and deals 115% damage 4 times. Level 11: MP Cost: 39, Attacks up to 8 enemies and deals 117% damage 4 times. Level 12: MP Cost: 39, Attacks up to 8 enemies and deals 119% damage 4 times. Level 13: MP Cost: 42, Attacks up to 8 enemies and deals 121% damage 4 times. Level 14: MP Cost: 42, Attacks up to 8 enemies and deals 123% damage 4 times. Level 15: MP Cost: 42, Attacks up to 8 enemies and deals 125% damage 4 times. Level 16: MP Cost: 42, Attacks up to 8 enemies and deals 127% damage 4 times. Level 17: MP Cost: 45, Attacks up to 8 enemies and deals 129% damage 4 times. Level 18: MP Cost: 45, Attacks up to 8 enemies and deals 131% damage 4 times. Level 19: MP Cost: 45, Attacks up to 8 enemies and deals 133% damage 4 times. Level 20: MP Cost: 45, Attacks up to 8 enemies and deals 135% damage 4 times. Effects: Effect, Effect0, Hit -> 1, 2, Mob, Special. Description: Summon the sacred unicorn to attack a number of enemies in front of you a couple of times and weaken them for a period of time. Weakened targets will be spiked a specific number of times and bosses will receive double the damage. Level 1: MP Cost: 38, Max number of enemies hit: 8, Damage: 112%, Attacks 5 times (all attacks are crtical), 19% chance to weaken the enemy and activate debuff effect for 5 seconds and increase the damage by 5% for 5 times. Level 2: MP Cost: 38, Max number of enemies hit: 8, Damage: 114%, Attacks 5 times (all attacks are crtical), 23% chance to weaken the enemy and activate debuff effect for 6 seconds and increase the damage by 6% for 5 times. Level 3: MP Cost: 38, Max number of enemies hit: 8, Damage: 116%, Attacks 5 times (all attacks are crtical), 27% chance to weaken the enemy and activate debuff effect for 6 seconds and increase the damage by 6% for 5 times. Level 4: MP Cost: 38, Max number of enemies hit: 8, Damage: 118%, Attacks 5 times (all attacks are crtical), 31% chance to weaken the enemy and activate debuff effect for 7 seconds and increase the damage by 7% for 6 times. Level 5: MP Cost: 38, Max number of enemies hit: 8, Damage: 120%, Attacks 5 times (all attacks are crtical), 35% chance to weaken the enemy and activate debuff effect for 7 seconds and increase the damage by 7% for 6 times. Level 6: MP Cost: 46, Max number of enemies hit: 8, Damage: 122%, Attacks 5 times (all attacks are crtical), 39% chance to weaken the enemy and activate debuff effect for 8 seconds and increase the damage by 8% for 6 times. Level 7: MP Cost: 46, Max number of enemies hit: 8, Damage: 124%, Attacks 5 times (all attacks are crtical), 43% chance to weaken the enemy and activate debuff effect for 8 seconds and increase the damage by 8% for 6 times. Level 8: MP Cost: 46, Max number of enemies hit: 8, Damage: 126%, Attacks 5 times (all attacks are crtical), 47% chance to weaken the enemy and activate debuff effect for 9 seconds and increase the damage by 9% for 7 times. Level 9: MP Cost: 46, Max number of enemies hit: 8, Damage: 128%, Attacks 5 times (all attacks are crtical), 51% chance to weaken the enemy and activate debuff effect for 9 seconds and increase the damage by 9% for 7 times. Level 10: MP Cost: 46, Max number of enemies hit: 8, Damage: 130%, Attacks 5 times (all attacks are crtical), 55% chance to weaken the enemy and activate debuff effect for 10 seconds and increase the damage by 10% for 7 times. Level 11: MP Cost: 54, Max number of enemies hit: 8, Damage: 132%, Attacks 5 times (all attacks are crtical), 59% chance to weaken the enemy and activate debuff effect for 10 seconds and increase the damage by 10% for 7 times. Level 12: MP Cost: 54, Max number of enemies hit: 8, Damage: 134%, Attacks 5 times (all attacks are crtical), 63% chance to weaken the enemy and activate debuff effect for 11 seconds and increase the damage by 11% for 8 times. Level 13: MP Cost: 54, Max number of enemies hit: 8, Damage: 136%, Attacks 5 times (all attacks are crtical), 67% chance to weaken the enemy and activate debuff effect for 11 seconds and increase the damage by 11% for 8 times. Level 14: MP Cost: 54, Max number of enemies hit: 8, Damage: 138%, Attacks 5 times (all attacks are crtical), 71% chance to weaken the enemy and activate debuff effect for 12 seconds and increase the damage by 12% for 8 times. Level 15: MP Cost: 54, Max number of enemies hit: 8, Damage: 140%, Attacks 5 times (all attacks are crtical), 75% chance to weaken the enemy and activate debuff effect for 12 seconds and increase the damage by 12% for 8 times. Level 16: MP Cost: 62, Max number of enemies hit: 8, Damage: 142%, Attacks 5 times (all attacks are crtical), 79% chance to weaken the enemy and activate debuff effect for 13 seconds and increase the damage by 13% for 9 times. Level 17: MP Cost: 62, Max number of enemies hit: 8, Damage: 144%, Attacks 5 times (all attacks are crtical), 83% chance to weaken the enemy and activate debuff effect for 13 seconds and increase the damage by 13% for 9 times. Level 18: MP Cost: 62, Max number of enemies hit: 8, Damage: 146%, Attacks 5 times (all attacks are crtical), 87% chance to weaken the enemy and activate debuff effect for 14 seconds and increase the damage by 14% for 9 times. Level 19: MP Cost: 62, Max number of enemies hit: 8, Damage: 148%, Attacks 5 times (all attacks are crtical), 91% chance to weaken the enemy and activate debuff effect for 14 seconds and increase the damage by 14% for 9 times. Level 20: MP Cost: 62, Max number of enemies hit: 8, Damage: 150%, Attacks 5 times (all attacks are crtical), 95% chance to weaken the enemy and activate debuff effect for 15 seconds and increase the damage by 15% for 10 times. 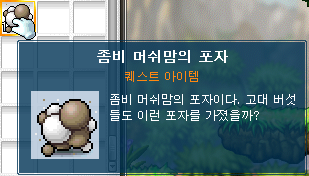 Description: Use the wind’s force to rapidly fall and attack the enemy a number of times while in the same range. The skill can only be done when you jump to a height of at least 120%. Level 1: MP Cost: 30, Attacks up to 6 enemies, Damage: 138%, Number of attacks: 3. Level 2: MP Cost: 30, Attacks up to 6 enemies, Damage: 141%, Number of attacks: 3. Level 3: MP Cost: 30, Attacks up to 6 enemies, Damage: 144%, Number of attacks: 3. Level 4: MP Cost: 30, Attacks up to 6 enemies, Damage: 147%, Number of attacks: 3. Level 5: MP Cost: 30, Attacks up to 6 enemies, Damage: 150%, Number of attacks: 3. Level 6: MP Cost: 35, Attacks up to 6 enemies, Damage: 153%, Number of attacks: 3. Level 7: MP Cost: 35, Attacks up to 6 enemies, Damage: 156%, Number of attacks: 3. Level 8: MP Cost: 35, Attacks up to 6 enemies, Damage: 159%, Number of attacks: 3. Level 9: MP Cost: 35, Attacks up to 6 enemies, Damage: 162%, Number of attacks: 3. Level 10: MP Cost: 35, Attacks up to 6 enemies, Damage: 165%, Number of attacks: 3. Level 11: MP Cost: 40, Attacks up to 6 enemies, Damage: 168%, Number of attacks: 3. Level 12: MP Cost: 40, Attacks up to 6 enemies, Damage: 171%, Number of attacks: 3. Level 13: MP Cost: 40, Attacks up to 6 enemies, Damage: 174%, Number of attacks: 3. Level 14: MP Cost: 40, Attacks up to 6 enemies, Damage: 177%, Number of attacks: 3. Level 15: MP Cost: 40, Attacks up to 6 enemies, Damage: 180%, Number of attacks: 3. Level 16: MP Cost: 45, Attacks up to 6 enemies, Damage: 183%, Number of attacks: 3. Level 17: MP Cost: 45, Attacks up to 6 enemies, Damage: 186%, Number of attacks: 3. Level 18: MP Cost: 45, Attacks up to 6 enemies, Damage: 189%, Number of attacks: 3. Level 19: MP Cost: 45, Attacks up to 6 enemies, Damage: 192%, Number of attacks: 3. Level 20: MP Cost: 45, Attacks up to 6 enemies, Damage: 195%, Number of attacks: 3. Description: Permanently adds a chance to ignore the enemy’s attacks and in addition increase the damage significantly using the Fire Spirit’s power for a certain period of time. Level 1: Active Effects: MP Cost: 40, ATT +2, Duration: 47 seconds. Passive Effects: 5% chance to avoid the enemey’s attack. Level 2: Active Effects: MP Cost: 40, ATT +4, Duration: 54 seconds. Level 3: Active Effects: MP Cost: 40, ATT +6, Duration: 61 seconds. Level 4: Active Effects: MP Cost: 40, ATT +8, Duration: 68 seconds. Passive Effects: 8% chance to avoid the enemey’s attack. Level 5: Active Effects: MP Cost: 45, ATT +10, Duration: 75 seconds. Level 6: Active Effects: MP Cost: 45, ATT +12, Duration: 82 seconds. Level 7: Active Effects: MP Cost: 45, ATT +14, Duration: 89 seconds. Level 8: Active Effects: MP Cost: 45, ATT +16, Duration: 96 seconds. Passive Effects: 11% chance to avoid the enemey’s attack. Level 9: Active Effects: MP Cost: 45, ATT +18, Duration: 103 seconds. Level 10: Active Effects: MP Cost: 50, ATT +20, Duration: 110 seconds. Level 11: Active Effects: MP Cost: 50, ATT +22, Duration: 117 seconds. Level 12: Active Effects: MP Cost: 50, ATT +24, Duration: 124 seconds. Passive Effects: 14% chance to avoid the enemey’s attack. Level 13: Active Effects: MP Cost: 50, ATT +26, Duration: 131 seconds. Level 14: Active Effects: MP Cost: 50, ATT +28, Duration: 138 seconds. Level 15: Active Effects: MP Cost: 55, ATT +30, Duration: 145 seconds. Level 16: Active Effects: MP Cost: 55, ATT +32, Duration: 152 seconds. Passive Effects: 17% chance to avoid the enemey’s attack. Level 17: Active Effects: MP Cost: 55, ATT +34, Duration: 159 seconds. Level 18: Active Effects: MP Cost: 55, ATT +36, Duration: 166 seconds. Level 19: Active Effects: MP Cost: 55, ATT +38, Duration: 173 seconds. Level 20: Active Effects: MP Cost: 60, ATT +40, Duration: 180 seconds. Passive Effects: 20% chance to avoid the enemey’s attack. Description: Use the spirit’s strength to create a water shield. The shield will absorb some of the damage taken and give you resistance against states. Level 1: MP Cost: 60, Duration: 104, Water shield absorbs 11% damage, Resistance to states increased by 6%. Level 2: MP Cost: 60, Duration: 108, Water shield absorbs 12% damage, Resistance to states increased by 7%. Level 3: MP Cost: 60, Duration: 112, Water shield absorbs 13% damage, Resistance to states increased by 8%. Level 4: MP Cost: 60, Duration: 116, Water shield absorbs 14% damage, Resistance to states increased by 9%. Level 5: MP Cost: 70, Duration: 120, Water shield absorbs 15% damage, Resistance to states increased by 10%. Level 6: MP Cost: 70, Duration: 124, Water shield absorbs 16% damage, Resistance to states increased by 11%. Level 7: MP Cost: 70, Duration: 128, Water shield absorbs 17% damage, Resistance to states increased by 12%. Level 8: MP Cost: 70, Duration: 132, Water shield absorbs 18% damage, Resistance to states increased by 13%. Level 9: MP Cost: 70, Duration: 136, Water shield absorbs 19% damage, Resistance to states increased by 14%. Level 10: MP Cost: 80, Duration: 140, Water shield absorbs 20% damage, Resistance to states increased by 15%. Level 11: MP Cost: 80, Duration: 144, Water shield absorbs 21% damage, Resistance to states increased by 16%. Level 12: MP Cost: 80, Duration: 148, Water shield absorbs 22% damage, Resistance to states increased by 17%. Level 13: MP Cost: 80, Duration: 152, Water shield absorbs 23% damage, Resistance to states increased by 18%. Level 14: MP Cost: 80, Duration: 156, Water shield absorbs 24% damage, Resistance to states increased by 19%. Level 15: MP Cost: 90, Duration: 160, Water shield absorbs 25% damage, Resistance to states increased by 20%. Level 16: MP Cost: 90, Duration: 164, Water shield absorbs 26% damage, Resistance to states increased by 21%. Level 17: MP Cost: 90, Duration: 168, Water shield absorbs 27% damage, Resistance to states increased by 22%. Level 18: MP Cost: 90, Duration: 172, Water shield absorbs 28% damage, Resistance to states increased by 23%. Level 19: MP Cost: 90, Duration: 176, Water shield absorbs 29% damage, Resistance to states increased by 24%. Level 20: MP Cost: 100, Duration: 180, Water shield absorbs 30% damage, Resistance to states increased by 25%. Effects: Effect, Hit -> 1, 2. Description: Used after your enemies are tossed to the air after Charge Drive. Your enemies will not see you floating in the air while you deliver a fast attack on them. Additionally, the damage of Charge Drive will permanently increase. Level 1: Active Effects: MP Cost: 24, Attacks up to 8 enemies, Damage: 106%, Attacks 6 times, 1% chance to instantly kill your enemy. Passive Effect: Charge Drive Damage +10%. Level 2: Active Effects: MP Cost: 24, Attacks up to 8 enemies, Damage: 107%, Attacks 6 times, 2% chance to instantly kill your enemy. Level 3: Active Effects: MP Cost: 24, Attacks up to 8 enemies, Damage: 108%, Attacks 6 times, 3% chance to instantly kill your enemy. Passive Effect: Charge Drive Damage +14%. Level 4: Active Effects: MP Cost: 24, Attacks up to 8 enemies, Damage: 109%, Attacks 6 times, 4% chance to instantly kill your enemy. Level 5: Active Effects: MP Cost: 24, Attacks up to 8 enemies, Damage: 110%, Attacks 6 times, 5% chance to instantly kill your enemy. Level 6: Active Effects: MP Cost: 28, Attacks up to 8 enemies, Damage: 111%, Attacks 6 times, 6% chance to instantly kill your enemy. Passive Effect: Charge Drive Damage +18%. Level 7: Active Effects: MP Cost: 28, Attacks up to 8 enemies, Damage: 112%, Attacks 6 times, 7% chance to instantly kill your enemy. Level 8: Active Effects: MP Cost: 28, Attacks up to 8 enemies, Damage: 113%, Attacks 6 times, 8% chance to instantly kill your enemy. Level 9: Active Effects: MP Cost: 28, Attacks up to 8 enemies, Damage: 114%, Attacks 6 times, 9% chance to instantly kill your enemy. Passive Effect: Charge Drive Damage +22%. Level 10: Active Effects: MP Cost: 28, Attacks up to 8 enemies, Damage: 115%, Attacks 6 times, 10% chance to instantly kill your enemy. Level 11: Active Effects: MP Cost: 32, Attacks up to 8 enemies, Damage: 116%, Attacks 6 times, 11% chance to instantly kill your enemy. Level 12: Active Effects: MP Cost: 32, Attacks up to 8 enemies, Damage: 117%, Attacks 6 times, 12% chance to instantly kill your enemy. Passive Effect: Charge Drive Damage +26%. Level 13: Active Effects: MP Cost: 32, Attacks up to 8 enemies, Damage: 118%, Attacks 6 times, 13% chance to instantly kill your enemy. Level 14: Active Effects: MP Cost: 32, Attacks up to 8 enemies, Damage: 119%, Attacks 6 times, 14% chance to instantly kill your enemy. Level 15: Active Effects: MP Cost: 32, Attacks up to 8 enemies, Damage: 120%, Attacks 6 times, 15% chance to instantly kill your enemy. Passive Effect: Charge Drive Damage +30%. Effects: Frost Spirit: Summoned, Stand, Fly, Attack1, Hit, Mob, Die. Fire Spirit: Summoned, Stand, Fly, Attack1, Hit, Mob, Die. Shadow Spirit: Summoned, Stand, Fly, Attack1, Hit, Die. Description: Summons one random spirit to help you fight; Frost Spirit, Fire Spirit, or Shadow Spirit. Frost Spirit: Your attacks have a chance to freeze the enemy. Fire Spirit: Attacks have a chance to make the enemy suffer from continuous fire damage. Shadow Spirit: Stronger damage than Frost and Fire Spirits. Level 1: MP Cost: 132, Summons 1 random spirit out of the 3 for 65 seconds. Frost Spirit: Damage: 360%, 14% chance to freeze the enemy for 3 seconds. Fire Spirit: 360% chance to deal continuous damage for 3 seconds, 53% damage every 1 second. Level 2: MP Cost: 132, Summons 1 random spirit out of the 3 for 70 seconds. Frost Spirit: Damage: 370%, 18% chance to freeze the enemy for 3 seconds. Fire Spirit: 370% chance to deal continuous damage for 3 seconds, 56% damage every 1 second. Level 3: MP Cost: 124, Summons 1 random spirit out of the 3 for 75 seconds. Frost Spirit: Damage: 380%, 22% chance to freeze the enemy for 3 seconds. Fire Spirit: 380% chance to deal continuous damage for 3 seconds, 59% damage every 1 second. Level 4: MP Cost: 124, Summons 1 random spirit out of the 3 for 80 seconds. Frost Spirit: Damage: 390%, 26% chance to freeze the enemy for 3 seconds. Fire Spirit: 390% chance to deal continuous damage for 3 seconds, 62% damage every 1 second. Level 5: MP Cost: 116, Summons 1 random spirit out of the 3 for 85 seconds. Frost Spirit: Damage: 400%, 30% chance to freeze the enemy for 3 seconds. Fire Spirit: 400% chance to deal continuous damage for 3 seconds, 65% damage every 1 second. Level 6: MP Cost: 116, Summons 1 random spirit out of the 3 for 90 seconds. Frost Spirit: Damage: 410%, 34% chance to freeze the enemy for 3 seconds. Fire Spirit: 410% chance to deal continuous damage for 3 seconds, 68% damage every 1 second. Level 7: MP Cost: 108, Summons 1 random spirit out of the 3 for 95 seconds. Frost Spirit: Damage: 420%, 38% chance to freeze the enemy for 3 seconds. Fire Spirit: 420% chance to deal continuous damage for 3 seconds, 71% damage every 1 second. Level 8: MP Cost: 108, Summons 1 random spirit out of the 3 for 100 seconds. Frost Spirit: Damage: 430%, 42% chance to freeze the enemy for 3 seconds. Fire Spirit: 430% chance to deal continuous damage for 3 seconds, 74% damage every 1 second. Level 9: MP Cost: 100, Summons 1 random spirit out of the 3 for 105 seconds. Frost Spirit: Damage: 440%, 46% chance to freeze the enemy for 3 seconds. Fire Spirit: 440% chance to deal continuous damage for 3 seconds, 77% damage every 1 second. Level 10: MP Cost: 100, Summons 1 random spirit out of the 3 for 110 seconds. Frost Spirit: Damage: 450%, 50% chance to freeze the enemy for 4 seconds. Fire Spirit: 450% chance to deal continuous damage for 4 seconds, 80% damage every 1 second. Level 11: MP Cost: 92, Summons 1 random spirit out of the 3 for 115 seconds. Frost Spirit: Damage: 460%, 54% chance to freeze the enemy for 4 seconds. Fire Spirit: 460% chance to deal continuous damage for 4 seconds, 83% damage every 1 second. Level 12: MP Cost: 92, Summons 1 random spirit out of the 3 for 120 seconds. Frost Spirit: Damage: 470%, 58% chance to freeze the enemy for 4 seconds. Fire Spirit: 470% chance to deal continuous damage for 4 seconds, 86% damage every 1 second. Level 13: MP Cost: 84, Summons 1 random spirit out of the 3 for 125 seconds. Frost Spirit: Damage: 480%, 62% chance to freeze the enemy for 4 seconds. Fire Spirit: 480% chance to deal continuous damage for 4 seconds, 89% damage every 1 second. Level 14: MP Cost: 84, Summons 1 random spirit out of the 3 for 130 seconds. Frost Spirit: Damage: 490%, 66% chance to freeze the enemy for 4 seconds. Fire Spirit: 490% chance to deal continuous damage for 4 seconds, 92% damage every 1 second. Level 15: MP Cost: 76, Summons 1 random spirit out of the 3 for 135 seconds. Frost Spirit: Damage: 500%, 70% chance to freeze the enemy for 4 seconds. Fire Spirit: 500% chance to deal continuous damage for 4 seconds, 95% damage every 1 second. Level 16: MP Cost: 76, Summons 1 random spirit out of the 3 for 140 seconds. Frost Spirit: Damage: 510%, 74% chance to freeze the enemy for 4 seconds. Fire Spirit: 510% chance to deal continuous damage for 4 seconds, 98% damage every 1 second. Level 17: MP Cost: 68, Summons 1 random spirit out of the 3 for 145 seconds. Frost Spirit: Damage: 520%, 78% chance to freeze the enemy for 4 seconds. Fire Spirit: 520% chance to deal continuous damage for 4 seconds, 101% damage every 1 second. Level 18: MP Cost: 68, Summons 1 random spirit out of the 3 for 150 seconds. Frost Spirit: Damage: 530%, 82% chance to freeze the enemy for 4 seconds. Fire Spirit: 530% chance to deal continuous damage for 4 seconds, 104% damage every 1 second. Level 19: MP Cost: 60, Summons 1 random spirit out of the 3 for 155 seconds. Frost Spirit: Damage: 540%, 86% chance to freeze the enemy for 4 seconds. Fire Spirit: 540% chance to deal continuous damage for 4 seconds, 107% damage every 1 second. Level 20: MP Cost: 60, Summons 1 random spirit out of the 3 for 160 seconds. Frost Spirit: Damage: 550%, 90% chance to freeze the enemy for 5 seconds. Fire Spirit: 550% chance to deal continuous damage for 5 seconds, 110% damage every 1 second. Explanation: One SP on every skill as I always do on 3rd job especially and then you max your main skill, Strike Dual Shot, which is the same as your previous skills except obviously better. We then max your best buff, Ignis Lore. It will give you 40 ATT and you’ll get a 20% chance to avoid the enemy’s attacks which is awesome! Another great buff that will absorb 30% of the damage received is Water Shield, so we max that next. I know you probably don’t use anything but Strike Dual Shot, which is fine that’s also what I do, but you might want to add some Flying Assaulter action and max Gust Dive. Elemental Knights is maxed right after to improve your summons and later Leaf Tornado. We max Leaf Tornado because it’s a really good bossing skill and at 110 you’ll probably be bossing and using it a lot. Unicorn Spike is a powerful and a cool skill so we max that and lower the cooldown to 5 seconds. We leave High Kick Demolition at 11 since it’s another skill used after Charge Drive and again, it will be improved in 4th job. No point in maxing it so we leave it at level 11/15. Description: Borrow the legendary weapons with Ishtar’s power to massively fire the enemies in front of you. In addition, permanently increase the damage of Strike Dual Shot. Level 1: Active Effects: MP Cost: 8, Continuous Damage: 81%. Passive Effect: Strike Dual Shot’s damage +7%. Level 2: Active Effects: MP Cost: 8, Continuous Damage: 82%. Level 3: Active Effects: MP Cost: 8, Continuous Damage: 83%. Level 4: Active Effects: MP Cost: 8, Continuous Damage: 84%. Passive Effect: Strike Dual Shot’s damage +9%. Level 5: Active Effects: MP Cost: 8, Continuous Damage: 85%. Level 6: Active Effects: MP Cost: 8, Continuous Damage: 86%. Level 7: Active Effects: MP Cost: 8, Continuous Damage: 87%. Passive Effect: Strike Dual Shot’s damage +11%. Level 8: Active Effects: MP Cost: 8, Continuous Damage: 88%. Level 9: Active Effects: MP Cost: 8, Continuous Damage: 89%. Level 10: Active Effects: MP Cost: 8, Continuous Damage: 90%. Passive Effect: Strike Dual Shot’s damage +13%. Level 11: Active Effects: MP Cost: 9, Continuous Damage: 91%. Level 12: Active Effects: MP Cost: 9, Continuous Damage: 92%. Level 13: Active Effects: MP Cost: 9, Continuous Damage: 93%. Passive Effect: Strike Dual Shot’s damage +15%. Level 14: Active Effects: MP Cost: 9, Continuous Damage: 94%. Level 15: Active Effects: MP Cost: 9, Continuous Damage: 95%. Level 16: Active Effects: MP Cost: 9, Continuous Damage: 96%. Passive Effect: Strike Dual Shot’s damage +17%. Level 17: Active Effects: MP Cost: 9, Continuous Damage: 97%. Level 18: Active Effects: MP Cost: 9, Continuous Damage: 98%. Level 19: Active Effects: MP Cost: 9, Continuous Damage: 99%. Passive Effect: Strike Dual Shot’s damage +19%. Level 20: Active Effects: MP Cost: 9, Continuous Damage: 100%. Level 21: Active Effects: MP Cost: 10, Continuous Damage: 101%. Level 22: Active Effects: MP Cost: 10, Continuous Damage: 102%. Passive Effect: Strike Dual Shot’s damage +21%. Level 23: Active Effects: MP Cost: 10, Continuous Damage: 103%. Level 24: Active Effects: MP Cost: 10, Continuous Damage: 104%. Level 25: Active Effects: MP Cost: 10, Continuous Damage: 105%. Passive Effect: Strike Dual Shot’s damage +23%. Level 26: Active Effects: MP Cost: 10, Continuous Damage: 106%. Level 27: Active Effects: MP Cost: 10, Continuous Damage: 107%. Level 28: Active Effects: MP Cost: 10, Continuous Damage: 108%. Passive Effect: Strike Dual Shot’s damage +25%. Level 29: Active Effects: MP Cost: 10, Continuous Damage: 109%. Level 30: Active Effects: MP Cost: 10, Continuous Damage: 110%. Description: Jump and drop a many legendary arrows and attack a large number of enemies. Enemy’s defense will be lowered and every hit will be 100% critical. In addition, the damage of Leaf Tornado will permanently increase. Level 1: Active Effects: MP Cost: 40, Maximum number of enemies hit: 12, Damage: 458%, Number of attacks: 2. Reduces the enemy’s defense by -1% for 5 seconds. Passive Effects: Leaf Tornado +11% damage. Level 2: Active Effects: MP Cost: 40, Maximum number of enemies hit: 12, Damage: 464%, Number of attacks: 2. Reduces the enemy’s defense by -2% for 6 seconds. Passive Effects: Leaf Tornado +12% damage. Level 3: Active Effects: MP Cost: 40, Maximum number of enemies hit: 12, Damage: 470%, Number of attacks: 2. Reduces the enemy’s defense by -3% for 6 seconds. Passive Effects: Leaf Tornado +13% damage. Level 4: Active Effects: MP Cost: 40, Maximum number of enemies hit: 12, Damage: 476%, Number of attacks: 2. Reduces the enemy’s defense by -4% for 7 seconds. Passive Effects: Leaf Tornado +14% damage. Level 5: Active Effects: MP Cost: 45, Maximum number of enemies hit: 12, Damage: 482%, Number of attacks: 2. Reduces the enemy’s defense by -5% for 7 seconds. Passive Effects: Leaf Tornado +15% damage. Level 6: Active Effects: MP Cost: 45, Maximum number of enemies hit: 12, Damage: 488%, Number of attacks: 2. Reduces the enemy’s defense by -6% for 8 seconds. Passive Effects: Leaf Tornado +16% damage. Level 7: Active Effects: MP Cost: 45, Maximum number of enemies hit: 12, Damage: 494%, Number of attacks: 2. Reduces the enemy’s defense by -7% for 8 seconds. Passive Effects: Leaf Tornado +17% damage. Level 8: Active Effects: MP Cost: 45, Maximum number of enemies hit: 12, Damage: 500%, Number of attacks: 2. Reduces the enemy’s defense by -8% for 9 seconds. Passive Effects: Leaf Tornado +18% damage. Level 9: Active Effects: MP Cost: 45, Maximum number of enemies hit: 12, Damage: 506%, Number of attacks: 2. Reduces the enemy’s defense by -9% for 9 seconds. Passive Effects: Leaf Tornado +19% damage. Level 10: Active Effects: MP Cost: 50, Maximum number of enemies hit: 12, Damage: 512%, Number of attacks: 2. Reduces the enemy’s defense by -10% for 10 seconds. Passive Effects: Leaf Tornado +20% damage. Level 11: Active Effects: MP Cost: 50, Maximum number of enemies hit: 12, Damage: 518%, Number of attacks: 2. Reduces the enemy’s defense by -11% for 10 seconds. 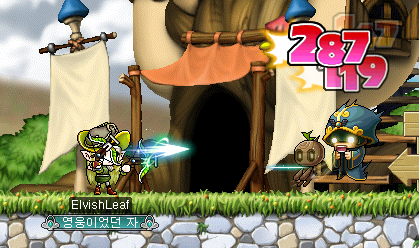 Passive Effects: Leaf Tornado +21% damage. Level 12: Active Effects: MP Cost: 50, Maximum number of enemies hit: 12, Damage: 524%, Number of attacks: 2. Reduces the enemy’s defense by -12% for 11 seconds. Passive Effects: Leaf Tornado +22% damage. Level 13: Active Effects: MP Cost: 50, Maximum number of enemies hit: 12, Damage: 530%, Number of attacks: 2. Reduces the enemy’s defense by -13% for 11 seconds. Passive Effects: Leaf Tornado +23% damage. Level 14: Active Effects: MP Cost: 50, Maximum number of enemies hit: 12, Damage: 536%, Number of attacks: 2. Reduces the enemy’s defense by -14% for 12 seconds. Passive Effects: Leaf Tornado +24% damage. Level 15: Active Effects: MP Cost: 55, Maximum number of enemies hit: 12, Damage: 542%, Number of attacks: 2. Reduces the enemy’s defense by -15% for 12 seconds. Passive Effects: Leaf Tornado +25% damage. Level 16: Active Effects: MP Cost: 55, Maximum number of enemies hit: 12, Damage: 548%, Number of attacks: 2. Reduces the enemy’s defense by -16% for 13 seconds. Passive Effects: Leaf Tornado +26% damage. Level 17: Active Effects: MP Cost: 55, Maximum number of enemies hit: 12, Damage: 554%, Number of attacks: 2. Reduces the enemy’s defense by -17% for 13 seconds. Passive Effects: Leaf Tornado +27% damage. Level 18: Active Effects: MP Cost: 55, Maximum number of enemies hit: 12, Damage: 560%, Number of attacks: 2. Reduces the enemy’s defense by -18% for 14 seconds. Passive Effects: Leaf Tornado +28% damage. Level 19: Active Effects: MP Cost: 55, Maximum number of enemies hit: 12, Damage: 566%, Number of attacks: 2. Reduces the enemy’s defense by -19% for 14 seconds. Passive Effects: Leaf Tornado +29% damage. Level 20: Active Effects: MP Cost: 60, Maximum number of enemies hit: 12, Damage: 572%, Number of attacks: 2. Reduces the enemy’s defense by -20% for 15 seconds. Passive Effects: Leaf Tornado +30% damage. Description: Instantly move forward and attack the enemies in your path. Level 1: MP Cost: 54, Maximum Number of Enemies Hit: 8, Damage: 290%, Attacks 3 times. Level 2: MP Cost: 54, Maximum Number of Enemies Hit: 8, Damage: 295%, Attacks 3 times. Level 3: MP Cost: 54, Maximum Number of Enemies Hit: 8, Damage: 300%, Attacks 3 times. Level 4: MP Cost: 54, Maximum Number of Enemies Hit: 8, Damage: 305%, Attacks 3 times. Level 5: MP Cost: 54, Maximum Number of Enemies Hit: 8, Damage: 310%, Attacks 3 times. Level 6: MP Cost: 58, Maximum Number of Enemies Hit: 8, Damage: 315%, Attacks 3 times. Level 7: MP Cost: 58, Maximum Number of Enemies Hit: 8, Damage: 320%, Attacks 3 times. Level 8: MP Cost: 58, Maximum Number of Enemies Hit: 8, Damage: 325%, Attacks 3 times. Level 9: MP Cost: 58, Maximum Number of Enemies Hit: 8, Damage: 330%, Attacks 3 times. Level 10: MP Cost: 58, Maximum Number of Enemies Hit: 8, Damage: 335%, Attacks 3 times. Level 11: MP Cost: 62, Maximum Number of Enemies Hit: 8, Damage: 340%, Attacks 3 times. Level 12: MP Cost: 62, Maximum Number of Enemies Hit: 8, Damage: 345%, Attacks 3 times. Level 13: MP Cost: 62, Maximum Number of Enemies Hit: 8, Damage: 350%, Attacks 3 times. Level 14: MP Cost: 62, Maximum Number of Enemies Hit: 8, Damage: 355%, Attacks 3 times. Level 15: MP Cost: 62, Maximum Number of Enemies Hit: 8, Damage: 360%, Attacks 3 times. Level 16: MP Cost: 66, Maximum Number of Enemies Hit: 8, Damage: 365%, Attacks 3 times. Level 17: MP Cost: 66, Maximum Number of Enemies Hit: 8, Damage: 370%, Attacks 3 times. Level 18: MP Cost: 66, Maximum Number of Enemies Hit: 8, Damage: 375%, Attacks 3 times. Level 19: MP Cost: 66, Maximum Number of Enemies Hit: 8, Damage: 380%, Attacks 3 times. Level 20: MP Cost: 66, Maximum Number of Enemies Hit: 8, Damage: 385%, Attacks 3 times. Level 21: MP Cost: 70, Maximum Number of Enemies Hit: 8, Damage: 390%, Attacks 3 times. Level 22: MP Cost: 70, Maximum Number of Enemies Hit: 8, Damage: 395%, Attacks 3 times. Level 23: MP Cost: 70, Maximum Number of Enemies Hit: 8, Damage: 400%, Attacks 3 times. Level 24: MP Cost: 70, Maximum Number of Enemies Hit: 8, Damage: 405%, Attacks 3 times. Level 25: MP Cost: 70, Maximum Number of Enemies Hit: 8, Damage: 410%, Attacks 3 times. Level 26: MP Cost: 74, Maximum Number of Enemies Hit: 8, Damage: 415%, Attacks 3 times. Level 27: MP Cost: 74, Maximum Number of Enemies Hit: 8, Damage: 420%, Attacks 3 times. Level 28: MP Cost: 74, Maximum Number of Enemies Hit: 8, Damage: 425%, Attacks 3 times. Level 29: MP Cost: 74, Maximum Number of Enemies Hit: 8, Damage: 430%, Attacks 3 times. Level 30: MP Cost: 74, Maximum Number of Enemies Hit: 8, Damage: 435%, Attacks 3 times. 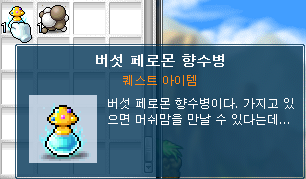 Description: Let the ancient spirits take care of you for a period of time and increase your HP and damage. Ignis Lore’s avoidance probability will also increase. Level 1: Active Effects: MP Cost: 45, Duration: 65 seconds, Damage: +1%, HP: +50. Passive Effects: Ignis Lore’s avoidance probability +6%. Level 2: Active Effects: MP Cost: 45, Duration: 70 seconds, Damage: +2%, HP: +100. Level 3: Active Effects: MP Cost: 45, Duration: 75 seconds, Damage: +3%, HP: +150. Passive Effects: Ignis Lore’s avoidance probability +7%. Level 4: Active Effects: MP Cost: 50, Duration: 80 seconds, Damage: +4%, HP: +200. Level 5: Active Effects: MP Cost: 50, Duration: 85 seconds, Damage: +5%, HP: +250. Passive Effects: Ignis Lore’s avoidance probability +8%. Level 6: Active Effects: MP Cost: 50, Duration: 90 seconds, Damage: +6%, HP: +300. Level 7: Active Effects: MP Cost: 50, Duration: 95 seconds, Damage: +7%, HP: +350. Passive Effects: Ignis Lore’s avoidance probability +9%. Level 8: Active Effects: MP Cost: 55, Duration: 100 seconds, Damage: +8%, HP: +400. Level 9: Active Effects: MP Cost: 55, Duration: 105 seconds, Damage: +9%, HP: +450. Passive Effects: Ignis Lore’s avoidance probability +10%. Level 10: Active Effects: MP Cost: 55, Duration: 110 seconds, Damage: +10%, HP: +500. Level 11: Active Effects: MP Cost: 55, Duration: 115 seconds, Damage: +11%, HP: +550. Passive Effects: Ignis Lore’s avoidance probability +11%. Level 12: Active Effects: MP Cost: 60, Duration: 120 seconds, Damage: +12%, HP: +600. Level 13: Active Effects: MP Cost: 60, Duration: 125 seconds, Damage: +13%, HP: +650. Passive Effects: Ignis Lore’s avoidance probability +12%. Level 14: Active Effects: MP Cost: 60, Duration: 130 seconds, Damage: +14%, HP: +700. Level 15: Active Effects: MP Cost: 60, Duration: 135 seconds, Damage: +15%, HP: +750. Passive Effects: Ignis Lore’s avoidance probability +13%. Level 16: Active Effects: MP Cost: 65, Duration: 140 seconds, Damage: +16%, HP: +800. Level 17: Active Effects: MP Cost: 65, Duration: 145 seconds, Damage: +17%, HP: +850. Passive Effects: Ignis Lore’s avoidance probability +14%. Level 18: Active Effects: MP Cost: 65, Duration: 150 seconds, Damage: +18%, HP: +900. Level 19: Active Effects: MP Cost: 65, Duration: 155 seconds, Damage: +19%, HP: +950. Passive Effects: Ignis Lore’s avoidance probability +15%. Level 20: Active Effects: MP Cost: 70, Duration: 160 seconds, Damage: +20%, HP: +1000. Level 21: Active Effects: MP Cost: 70, Duration: 165 seconds, Damage: +21%, HP: +1050. Passive Effects: Ignis Lore’s avoidance probability +16%. Level 22: Active Effects: MP Cost: 70, Duration: 170 seconds, Damage: +22%, HP: +1100. Level 23: Active Effects: MP Cost: 70, Duration: 175 seconds, Damage: +23%, HP: +1150. Passive Effects: Ignis Lore’s avoidance probability +17%. Level 24: Active Effects: MP Cost: 75, Duration: 180 seconds, Damage: +24%, HP: +1200. Level 25: Active Effects: MP Cost: 75, Duration: 185 seconds, Damage: +25%, HP: +1250. Passive Effects: Ignis Lore’s avoidance probability +18%. Level 26: Active Effects: MP Cost: 75, Duration: 190 seconds, Damage: +26%, HP: +1300. Level 27: Active Effects: MP Cost: 75, Duration: 195 seconds, Damage: +27%, HP: +1350. Passive Effects: Ignis Lore’s avoidance probability +19%. Level 28: Active Effects: MP Cost: 80, Duration: 200 seconds, Damage: +28%, HP: +1400. 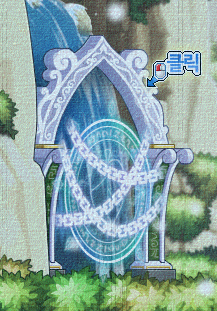 Level 29: Active Effects: MP Cost: 80, Duration: 205 seconds, Damage: +29%, HP: +1450. Passive Effects: Ignis Lore’s avoidance probability +20%. Level 30: Active Effects: MP Cost: 80, Duration: 210 seconds, Damage: +30%, HP: +1500. Description: Increase stats by a certain percentage for everyone in the party. Level 1: MP -10; all stats +1% for 30 seconds. Level 2: MP -10; all stats +1% for 60 seconds. Level 3: MP -10; all stats +2% for 90 seconds. Level 4: MP -10; all stats +2% for 120 seconds. Level 5: MP -20; all stats +3% for 150 seconds. Level 6: MP -20; all stats +3% for 180 seconds. Level 7: MP -20; all stats +4% for 210 seconds. Level 8: MP -20; all stats +4% for 240 seconds. Level 9: MP -20; all stats +5% for 270 seconds. Level 10: MP -30; all stats +5% for 300 seconds. Level 11: MP -30; all stats +6% for 330 seconds. Level 12: MP -30; all stats +6% for 360 seconds. Level 13: MP -30; all stats +7% for 390 seconds. Level 14: MP -30; all stats +7% for 420 seconds. Level 15: MP -40; all stats +8% for 450 seconds. Level 16: MP -40; all stats +8% for 480 seconds. Level 17: MP -40; all stats +9% for 510 seconds. Level 18: MP -40; all stats +9% for 540 seconds. Level 19: MP -40; all stats +10% for 570 seconds. Level 20: MP -50; all stats +10% for 600 seconds. Level 21: MP -50; all stats +11% for 630 seconds. Level 22: MP -50; all stats +11% for 660 seconds. Level 23: MP -50; all stats +12% for 690 seconds. Level 24: MP -50; all stats +12% for 720 seconds. Level 25: MP -60; all stats +13% for 750 seconds. Level 26: MP -60; all stats +13% for 780 seconds. Level 27: MP -60; all stats +14% for 810 seconds. Level 28: MP -60; all stats +14% for 840 seconds. Level 29: MP -60; all stats +15% for 870 seconds. Level 30: MP -70; all stats +15% for 900 seconds. Description: Enables one to shrug off abnormal conditions. The higher the skill level, the more types of abnormal conditions one can nullify. Level 1: MP -30, 600 second cooldown. Level 2: MP -30, 540 second cooldown. Level 3: MP -30, 480 second cooldown. Level 4: MP -30, 420 second cooldown. Level 5: MP -30, 360 second cooldown. Description: Increases the proficiency, Weapon ATT, and minimum critical damage when using a dual bow gun. Level 1: Mastery: +56%, Weapon ATT: +1, Minimum Critical Damage: +1%. Level 2: Mastery: +56%, Weapon ATT: +2, Minimum Critical Damage: +1%. Level 3: Mastery: +57%, Weapon ATT: +3, Minimum Critical Damage: +2%. Level 4: Mastery: +57%, Weapon ATT: +4, Minimum Critical Damage: +2%. Level 5: Mastery: +58%, Weapon ATT: +5, Minimum Critical Damage: +3%. Level 6: Mastery: +58%, Weapon ATT: +6, Minimum Critical Damage: +3%. Level 7: Mastery: +59%, Weapon ATT: +7, Minimum Critical Damage: +4%. Level 8: Mastery: +59%, Weapon ATT: +8, Minimum Critical Damage: +4%. Level 9: Mastery: +60%, Weapon ATT: +9, Minimum Critical Damage: +5%. Level 10: Mastery: +60%, Weapon ATT: +10, Minimum Critical Damage: +5%. Level 11: Mastery: +61%, Weapon ATT: +11, Minimum Critical Damage: +6%. Level 12: Mastery: +61%, Weapon ATT: +12, Minimum Critical Damage: +6%. Level 13: Mastery: +62%, Weapon ATT: +13, Minimum Critical Damage: +7%. Level 14: Mastery: +62%, Weapon ATT: +14, Minimum Critical Damage: +7%. Level 15: Mastery: +63%, Weapon ATT: +15, Minimum Critical Damage: +8%. Level 16: Mastery: +63%, Weapon ATT: +16, Minimum Critical Damage: +8%. Level 17: Mastery: +64%, Weapon ATT: +17, Minimum Critical Damage: +9%. Level 18: Mastery: +64%, Weapon ATT: +18, Minimum Critical Damage: +9%. Level 19: Mastery: +65%, Weapon ATT: +19, Minimum Critical Damage: +10%. Level 20: Mastery: +65%, Weapon ATT: +20, Minimum Critical Damage: +10%. Level 21: Mastery: +66%, Weapon ATT: +21, Minimum Critical Damage: +11%. Level 22: Mastery: +66%, Weapon ATT: +22, Minimum Critical Damage: +11%. Level 23: Mastery: +67%, Weapon ATT: +23, Minimum Critical Damage: +12%. Level 24: Mastery: +67%, Weapon ATT: +24, Minimum Critical Damage: +12%. Level 25: Mastery: +68%, Weapon ATT: +25, Minimum Critical Damage: +13%. Level 26: Mastery: +68%, Weapon ATT: +26, Minimum Critical Damage: +13%. Level 27: Mastery: +69%, Weapon ATT: +27, Minimum Critical Damage: +14%. Level 28: Mastery: +69%, Weapon ATT: +28, Minimum Critical Damage: +14%. Level 29: Mastery: +70%, Weapon ATT: +29, Minimum Critical Damage: +15%. Level 30: Mastery: +70%, Weapon ATT: +30, Minimum Critical Damage: +15%. Description: Attacks have a chance to ignore 100% of the enemy’s DEF. Works for bosses as well. Level 2: 4% chance to ignore 100% of the enemy’s DEF. Level 3: 6% chance to ignore 100% of the enemy’s DEF. Level 4: 8% chance to ignore 100% of the enemy’s DEF. Level 5: 10% chance to ignore 100% of the enemy’s DEF. Level 6: 12% chance to ignore 100% of the enemy’s DEF. Level 7: 14% chance to ignore 100% of the enemy’s DEF. Level 8: 16% chance to ignore 100% of the enemy’s DEF. Level 9: 18% chance to ignore 100% of the enemy’s DEF. Level 10: 20% chance to ignore 100% of the enemy’s DEF. Level 11: 22% chance to ignore 100% of the enemy’s DEF. Level 12: 24% chance to ignore 100% of the enemy’s DEF. Level 13: 26% chance to ignore 100% of the enemy’s DEF. Level 14: 28% chance to ignore 100% of the enemy’s DEF. Level 15: 30% chance to ignore 100% of the enemy’s DEF. Level 16: 32% chance to ignore 100% of the enemy’s DEF. Level 17: 34% chance to ignore 100% of the enemy’s DEF. Level 18: 36% chance to ignore 100% of the enemy’s DEF. Level 19: 38% chance to ignore 100% of the enemy’s DEF. Description: Used after your enemies are tossed to the air after Charge Drive. Spin rapidly in the air while you and your enemies float in the air and do continuous attacks. Additionally, Charge Drive’s damage will permanently increase. Level 1: Active Effects: MP Cost: 54, Max Number of Enemies Hit: 8, Damage: 152%, Number of attacks: 6. Passive Effects: Charge Drive Damage +12%. Level 2: Active Effects: MP Cost: 54, Max Number of Enemies Hit: 8, Damage: 154%, Number of attacks: 6. Passive Effects: Charge Drive Damage +14%. Level 3: Active Effects: MP Cost: 54, Max Number of Enemies Hit: 8, Damage: 156%, Number of attacks: 6. Passive Effects: Charge Drive Damage +16%. Level 4: Active Effects: MP Cost: 54, Max Number of Enemies Hit: 8, Damage: 158%, Number of attacks: 6. Passive Effects: Charge Drive Damage +18%. Level 5: Active Effects: MP Cost: 58, Max Number of Enemies Hit: 8, Damage: 160%, Number of attacks: 6. Passive Effects: Charge Drive Damage +20%. Level 6: Active Effects: MP Cost: 58, Max Number of Enemies Hit: 8, Damage: 162%, Number of attacks: 6. Passive Effects: Charge Drive Damage +22%. Level 7: Active Effects: MP Cost: 58, Max Number of Enemies Hit: 8, Damage: 164%, Number of attacks: 6. Passive Effects: Charge Drive Damage +24%. Level 8: Active Effects: MP Cost: 58, Max Number of Enemies Hit: 8, Damage: 166%, Number of attacks: 6. Passive Effects: Charge Drive Damage +26%. Level 9: Active Effects: MP Cost: 62, Max Number of Enemies Hit: 8, Damage: 168%, Number of attacks: 6. Passive Effects: Charge Drive Damage +28%. Level 10: Active Effects: MP Cost: 62, Max Number of Enemies Hit: 8, Damage: 170%, Number of attacks: 6. Passive Effects: Charge Drive Damage +30%. Level 11: Active Effects: MP Cost: 62, Max Number of Enemies Hit: 8, Damage: 172%, Number of attacks: 6. Passive Effects: Charge Drive Damage +32%. Level 12: Active Effects: MP Cost: 62, Max Number of Enemies Hit: 8, Damage: 174%, Number of attacks: 6. Passive Effects: Charge Drive Damage +34%. Level 13: Active Effects: MP Cost: 66, Max Number of Enemies Hit: 8, Damage: 176%, Number of attacks: 6. Passive Effects: Charge Drive Damage +36%. Level 14: Active Effects: MP Cost: 66, Max Number of Enemies Hit: 8, Damage: 178%, Number of attacks: 6. Passive Effects: Charge Drive Damage +38%. Level 15: Active Effects: MP Cost: 66, Max Number of Enemies Hit: 8, Damage: 180%, Number of attacks: 6. Passive Effects: Charge Drive Damage +40%. Level 16: Active Effects: MP Cost: 66, Max Number of Enemies Hit: 8, Damage: 182%, Number of attacks: 6. Passive Effects: Charge Drive Damage +42%. Level 17: Active Effects: MP Cost: 70, Max Number of Enemies Hit: 8, Damage: 184%, Number of attacks: 6. Passive Effects: Charge Drive Damage +44%. Level 18: Active Effects: MP Cost: 70, Max Number of Enemies Hit: 8, Damage: 186%, Number of attacks: 6. Passive Effects: Charge Drive Damage +46%. Level 19: Active Effects: MP Cost: 70, Max Number of Enemies Hit: 8, Damage: 188%, Number of attacks: 6. Passive Effects: Charge Drive Damage +48%. Level 20: Active Effects: MP Cost: 70, Max Number of Enemies Hit: 8, Damage: 190%, Number of attacks: 6. Passive Effects: Charge Drive Damage +50%. 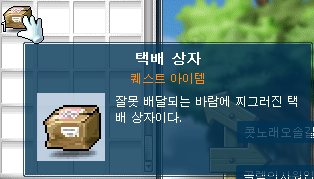 Description: Permanently increases your damage and accuracy, along with the probability and damage of Final Attack. Level 1: Permanently increases your damage by 6 and accuracy by 1%. The probability of Final Attack increased by 41% and damage by 76%, Attacks 2 times. Level 2: Permanently increases your damage by 6 and accuracy by 1%. The probability of Final Attack increased by 42% and damage by 77%, Attacks 2 times. Level 3: Permanently increases your damage by 7 and accuracy by 1%. The probability of Final Attack increased by 43% and damage by 78%, Attacks 2 times. Level 4: Permanently increases your damage by 7 and accuracy by 2%. The probability of Final Attack increased by 44% and damage by 79%, Attacks 2 times. Level 5: Permanently increases your damage by 8 and accuracy by 2%. The probability of Final Attack increased by 45% and damage by 80%, Attacks 2 times. Level 6: Permanently increases your damage by 8 and accuracy by 2%. The probability of Final Attack increased by 46% and damage by 81%, Attacks 2 times. Level 7: Permanently increases your damage by 9 and accuracy by 3%. The probability of Final Attack increased by 47% and damage by 82%, Attacks 2 times. Level 8: Permanently increases your damage by 9 and accuracy by 3%. The probability of Final Attack increased by 48% and damage by 83%, Attacks 2 times. Level 9: Permanently increases your damage by 10 and accuracy by 3%. The probability of Final Attack increased by 49% and damage by 84%, Attacks 2 times. Level 10: Permanently increases your damage by 10 and accuracy by 4%. The probability of Final Attack increased by 50% and damage by 85%, Attacks 2 times. Level 11: Permanently increases your damage by 11 and accuracy by 4%. The probability of Final Attack increased by 51% and damage by 86%, Attacks 2 times. Level 12: Permanently increases your damage by 11 and accuracy by 4%. The probability of Final Attack increased by 52% and damage by 87%, Attacks 2 times. Level 13: Permanently increases your damage by 12 and accuracy by 5%. The probability of Final Attack increased by 53% and damage by 88%, Attacks 2 times. Level 14: Permanently increases your damage by 12 and accuracy by 5%. The probability of Final Attack increased by 54% and damage by 89%, Attacks 2 times. Level 15: Permanently increases your damage by 13 and accuracy by 5%. The probability of Final Attack increased by 55% and damage by 90%, Attacks 2 times. Level 16: Permanently increases your damage by 13 and accuracy by 6%. The probability of Final Attack increased by 56% and damage by 91%, Attacks 2 times. Level 17: Permanently increases your damage by 14 and accuracy by 6%. The probability of Final Attack increased by 57% and damage by 92%, Attacks 2 times. Level 18: Permanently increases your damage by 14 and accuracy by 6%. The probability of Final Attack increased by 58% and damage by 93%, Attacks 2 times. Level 19: Permanently increases your damage by 15 and accuracy by 7%. The probability of Final Attack increased by 59% and damage by 94%, Attacks 2 times. Level 20: Permanently increases your damage by 15 and accuracy by 7%. The probability of Final Attack increased by 60% and damage by 95%, Attacks 2 times. Level 21: Permanently increases your damage by 16 and accuracy by 7%. The probability of Final Attack increased by 61% and damage by 96%, Attacks 2 times. Level 22: Permanently increases your damage by 16 and accuracy by 8%. The probability of Final Attack increased by 62% and damage by 97%, Attacks 2 times. Level 23: Permanently increases your damage by 17 and accuracy by 8%. The probability of Final Attack increased by 63% and damage by 98%, Attacks 2 times. Level 24: Permanently increases your damage by 17 and accuracy by 8%. The probability of Final Attack increased by 64% and damage by 99%, Attacks 2 times. Level 25: Permanently increases your damage by 18 and accuracy by 9%. The probability of Final Attack increased by 65% and damage by 100%, Attacks 2 times. Level 26: Permanently increases your damage by 18 and accuracy by 9%. The probability of Final Attack increased by 66% and damage by 101%, Attacks 2 times. Level 27: Permanently increases your damage by 19 and accuracy by 9%. The probability of Final Attack increased by 67% and damage by 102%, Attacks 2 times. Level 28: Permanently increases your damage by 19 and accuracy by 10%. The probability of Final Attack increased by 68% and damage by 103%, Attacks 2 times. Level 29: Permanently increases your damage by 20 and accuracy by 10%. The probability of Final Attack increased by 69% and damage by 104%, Attacks 2 times. Level 30: Permanently increases your damage by 20 and accuracy by 10%. The probability of Final Attack increased by 70% and damage by 105%, Attacks 2 times. Way too many worlds… Also I don’t understand why Mercedes get their own world even though there’s the Legend world. I bet there will be one for Demon Slayers, so Cannon Shooters will be the only ones without their own servers. Another Hot Time Event. 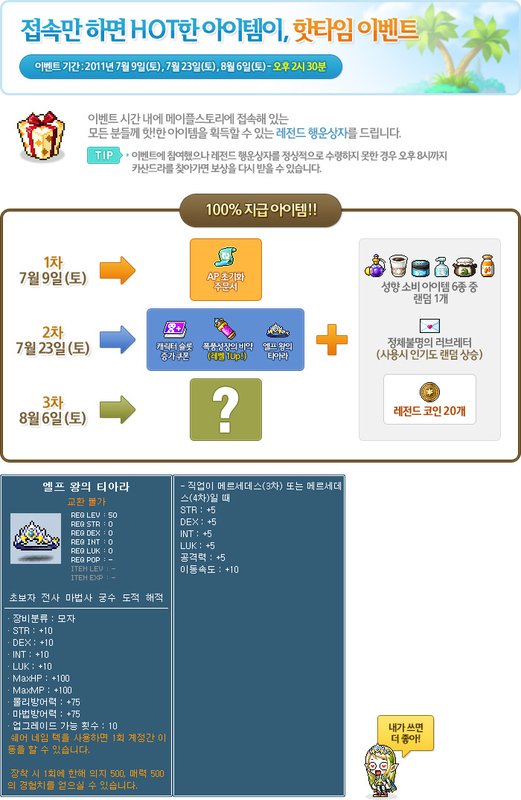 It will be on 7/23 at 2:30 P.M.
1 Free Level Up Capsule. The hat adds 10 STR/DEX/INT/LUK, 100 HP/MP, 75 Weapon/Magic DEF, 500 Will/Charm, and has 10 slots. Can be equipped by anyone. However, Mercedes at 3rd/4th job get an additional 5 STR/DEX/INT LUK, 5 Weapon Attack, and 10 Speed! So Mercedes characters level 70+ will get 15 STR/DEX/INT/LUK, 5 Weapon Attack, 100 HP/MP, 75 Weapon/Magic DEF, 10 Speed, and 500 Will/Charm! That mysterious love letter or whatever it’s called, same rewards as every Hot Time event. 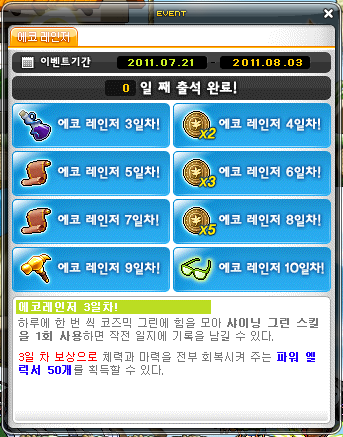 The Cosmic Green event was added. Except here, instead of Ergoth spawning, Dust King might spawn. Enjoy PvP Event. Depending on your level, the PvP NPC will want you to gain a certain amount of Battle Points to get 1 Legend Coin and 3 Gallant Emblems. Levels 30~69 = 200 Battle Points. Levels 70~119 = 350 Battle Points. Levels 120+ = 500 Battle Points. That’s pretty much it for now, the Legend Festival still continues! P.S. – What do you know? July 19th – GMS Age of Battle (check my Chaos guide, 8th page!). 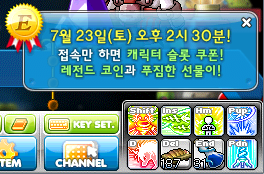 July 20th – KMS Mercedes patch. July 21st – EMS Big Bang patch. hey!! im actually doin a post bout Chaos! Are you serious? 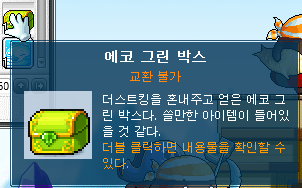 Works fine in KMST. the quests weren’t working before, they had to patch for it. That’s weird, lucky I didn’t make a Mercedes yet. Expect another patch to come and fix that skill then. Shakar, could i get some info of Mercedes from ur Blog, cause i need Mercedes info for mine. 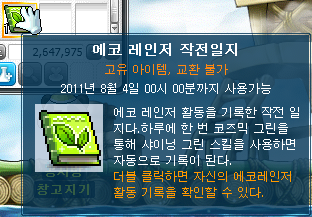 i dont play KMS but i try to read Maple Korean page (sometime (as this) i dont know what it says). so i need info. Why would you make a blog about kms if you don’t even play it ._. I do play but sometimes i dont know what it says ._. Could I suggest you only put the skill levels ath 1,11,21 and 30? It will cut down the size of your post drastically, yet keeping the same info. Shakar Omg i need your help! 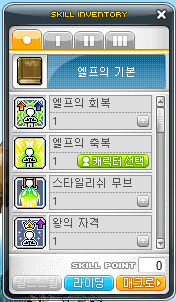 Dude when you play GMS tell me whether you could confirm that guard robot drops angelic blessing ring recipe alright? 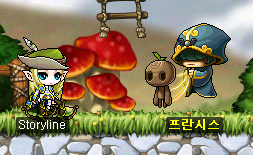 I can’t find Guard Robot on the Maple Inven database, but I think it does because of this thread. It’s also bold so I’m guessing it’s confirmed. Hey Shakar! Do you know how to get the lengend bow guns that have no str requirement? I believe it’s from the Legend Shop, isn’t it? thanks for your help.Just one more question,is the legendary weapons account tradable? 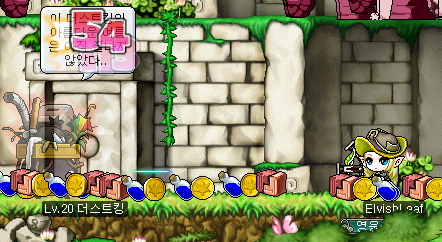 Cuz i think i have enough coins for the dual bows with my cannon shooter. But back on topic, they’re untradeable once equipped. well, that’s the part of being a girl, I like mercedes better than demon slayer. whats this thing about 10x exp i m hearing? 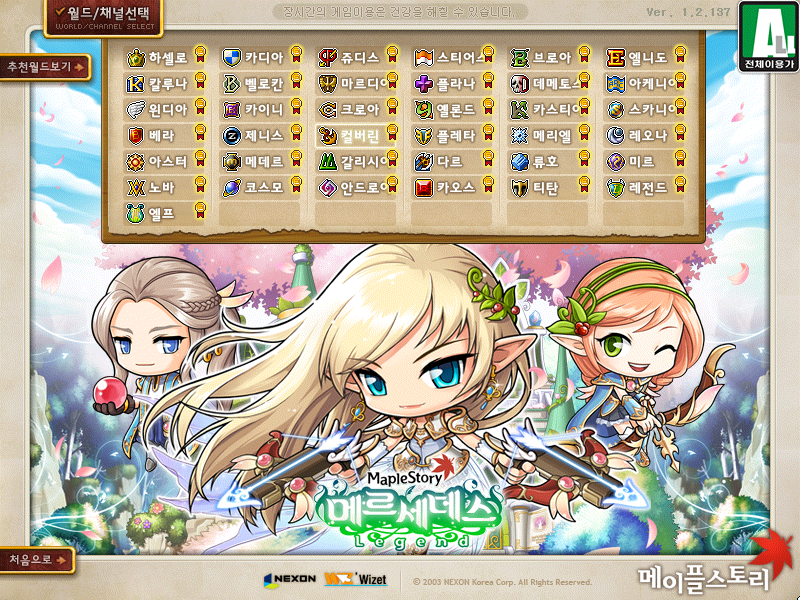 is nexon that insane? and if im in amarica is there any way that i could play kms? 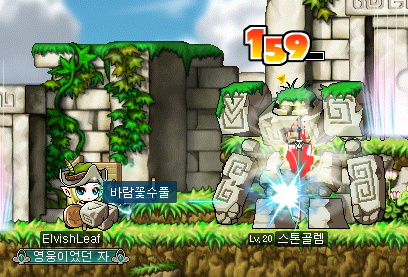 Remember that I’m talking about KMST, it’s Tespia and it’s just a test server. 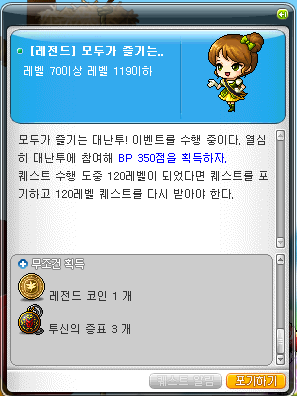 In GMS’s test server they let everyone be level 200, but instead of that in KMST they sometimes have 10x EXP (KMST terms go on for around 3~4 months so letting everyone be level 200 would be stupid). And yes it’s possible to play KMS, I live in America as well. You can get an account/help at Leafre.net. So high kick demolition doesn’t need final shot now? Hey what scrolls do you use on the dual bows? 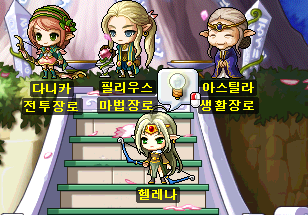 Is there new scrolls for them or do they use old bow scrolls? are we given a free character slot for each legend update? No, just on the first part. omg. Lots of info. I might end up making a girl mercedes cause the guy looks……well…yeah kinda too girly. The bad one is from the future. That’s the future, many many years after what we have now. Could someone link me to a detailed profession guide, im kinda confused on what im supposed to be doing. Shakar! I didnt knew it bout mercedes (cause i cant download KMS cause of the lack of space i guess its casue of the music i download and the roms for DS i download when im bored…) but i think ima delete some things and download KMS, if i can, Cya in game! Is that Helena supposed to be Athena? Do you mind if I use the story line you had in the beginning in a thread I’m contributing to in Basil? I wouldn’t mind, use it. 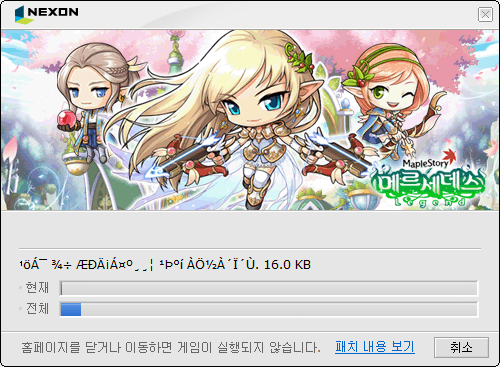 HOWEVER, please wait till I’m finished before you post it (I’ll make a new Mercedes in KMST and level it up quickly). Shakar, can Mercedes change hair and eyes? All the kms videos I see, the mercedes look exactly the same. I don’t believe it’s out yet but if they are they’re probably free. Can u do the update on what skills to build first on 4th job? And how come ur cannon shooter’s base dex is 5 instead of 4 in the starting? Can u also give me a guide on how to add stats on all the legend classes? Thx! No I just made a mistake and accidentally put 1 SP into DEX, but you start with 4. Cannon Shooter: Main Stat – STR, Secondary – DEX. Mercedes: Main Stat – DEX, Secondary – STR. DemonSlayer: Main Stat – STR, Secondary – DEX. People probably have asked u this, but where is da build for 4th job, or are u working on it? I have one question, According to some other blogs, Final Shot is a prerequisite for High Kick Demolition, and Final Shot has to be maxed, is this true or are the other blogs wrong? 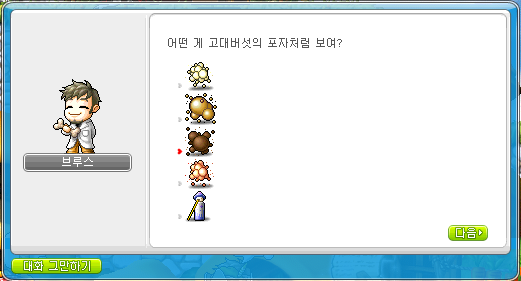 Also, it’s not High Kick Demolition anymore (I’ll just update it when it comes to GMS/T). Shakar, in some videos I see Mercedes recovering HP after every attack. What skill is that? 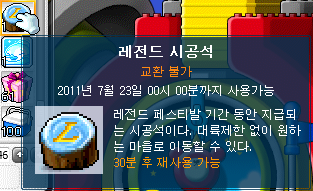 Don’t worry about it, it’s from when Mercedes first came out in KMST but it’s long gone. 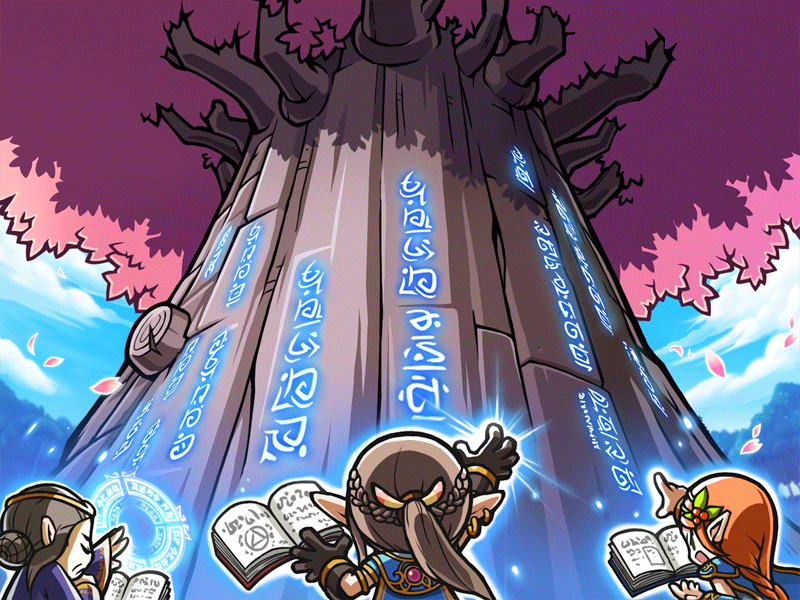 One question, Merces 4th job need books to learn skills?, i mean like a Night Lord need a book to learn Triple Throw. Hey um how much do u need to pay for the second unicorn thing cause i know that u need to pay 10 million for the blue unicorn but how much do u need to pay for the silver unicorn?